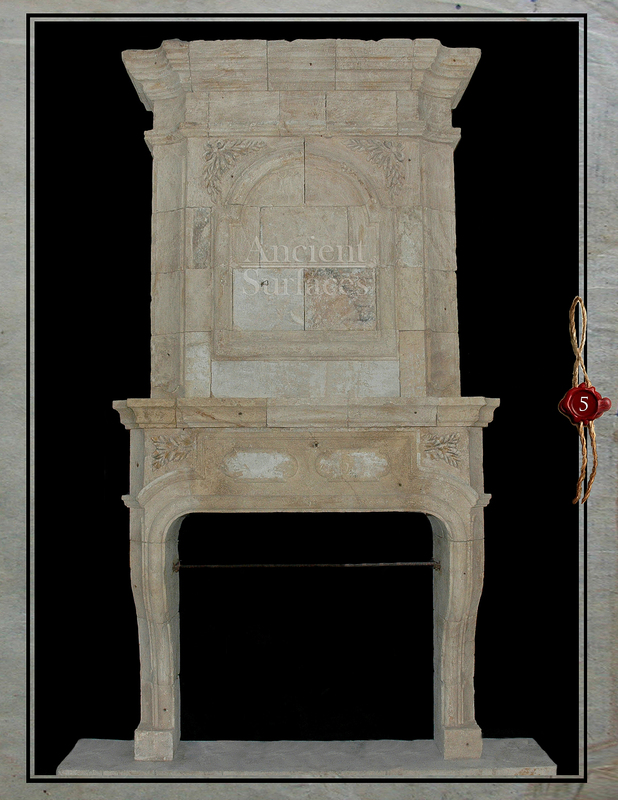 Antique Medieval Fireplaces | Antique Fireplaces by Ancient Surfaces. 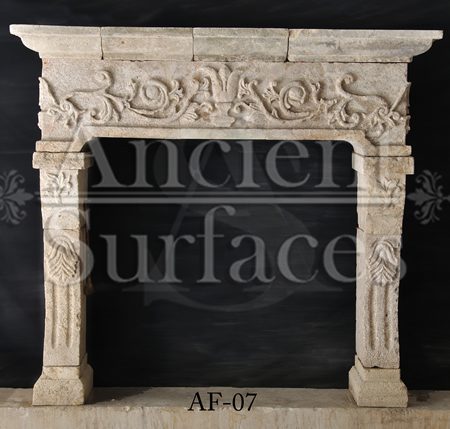 Antique Fireplaces by Ancient Surfaces. 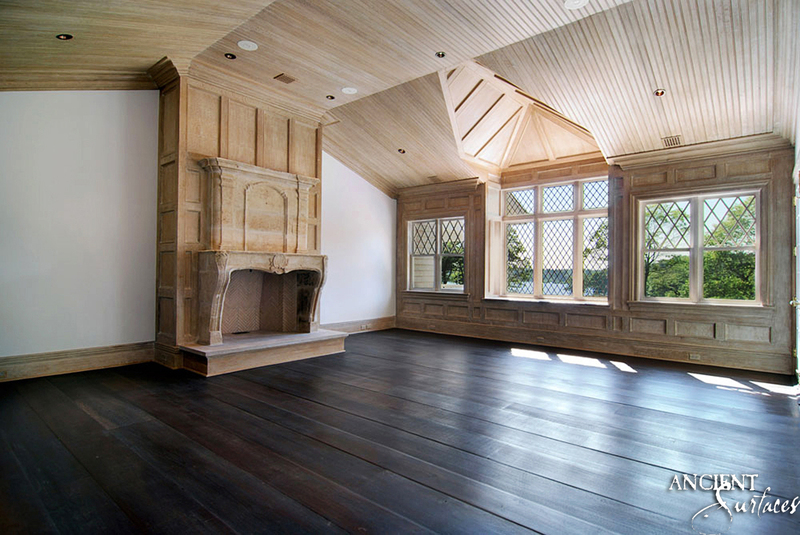 The Largest Library of Antique Fireplaces to be ever Assembled. 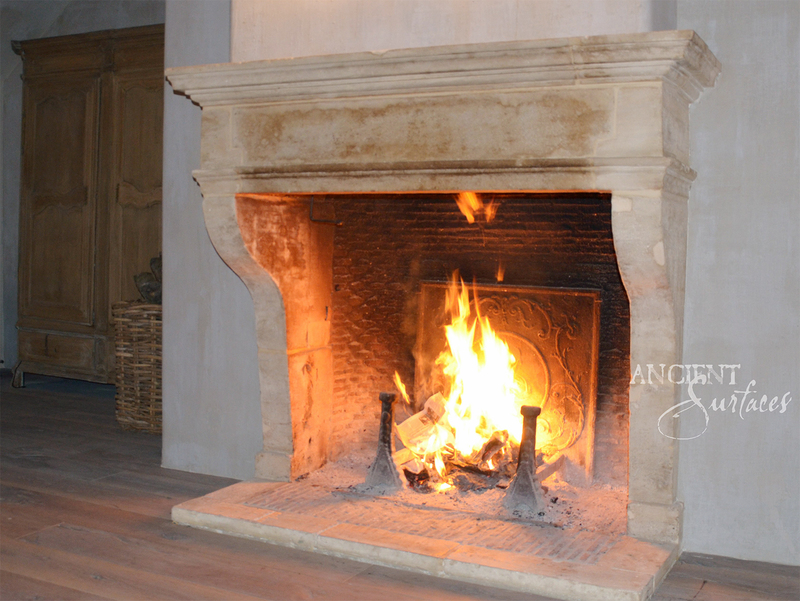 Keep calm, Ready your Limestone Fireplace, Winter is coming! 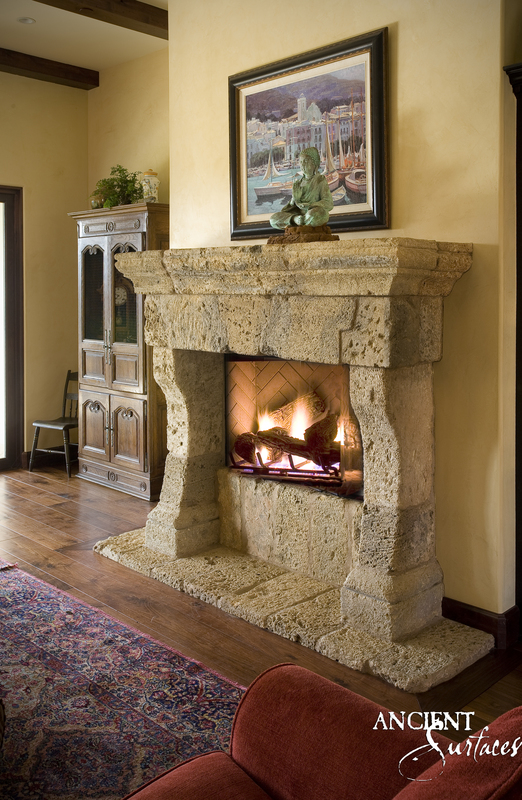 A solid stone mantle adds many factors of interest to a house. Providing not only a source of warmth, but style, beauty and value. 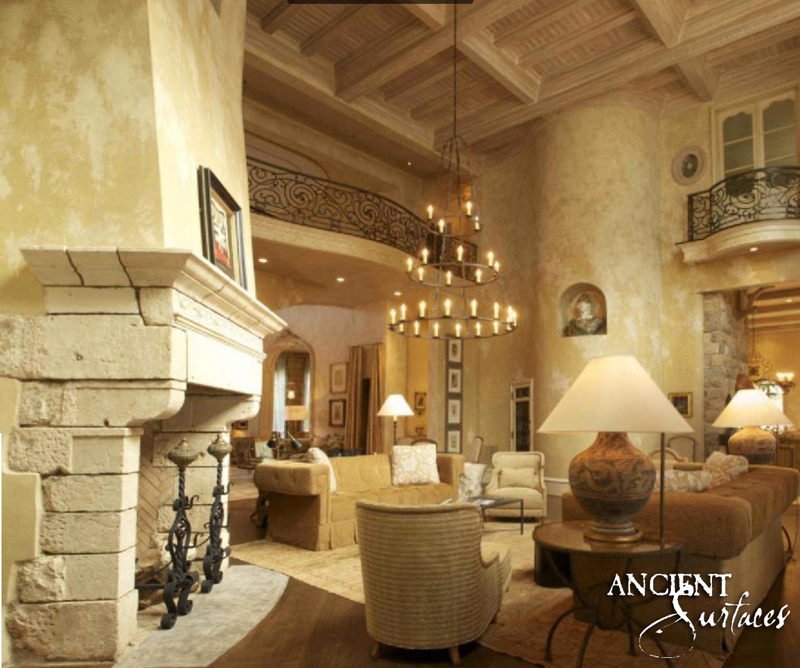 Ancient surface’s antique custom designed fireplaces are guaranteed to make your home the place where everyone wants to be. 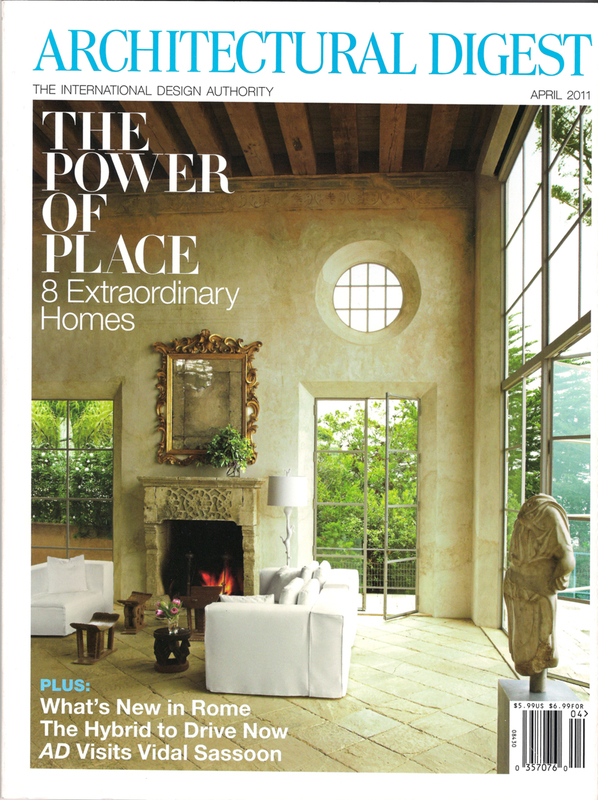 It easily becomes the centerpiece of your house, drawing both friends and family together around its warm glare. 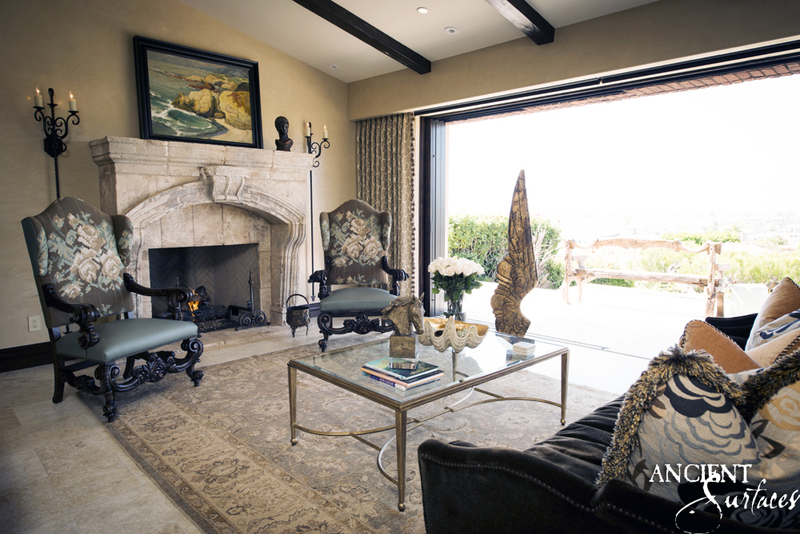 These stone fireplace design ideas from our past projects will inspire a space you’ll never want to leave. 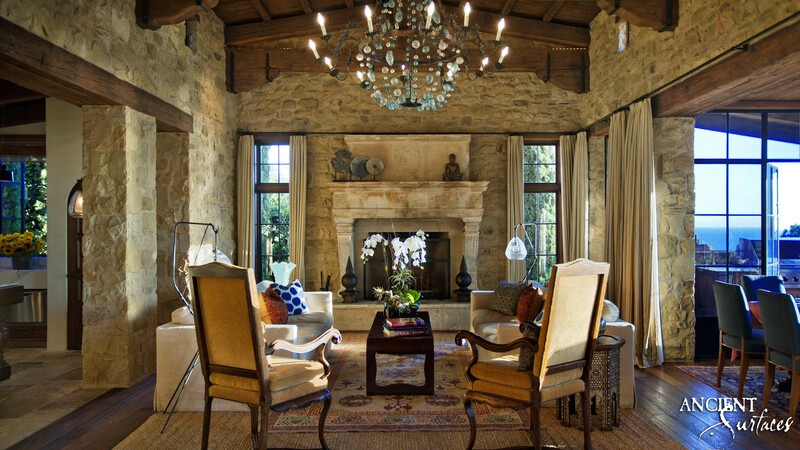 These stone fireplace design ideas from our past projects will inspire a space you’ll never want to leave. 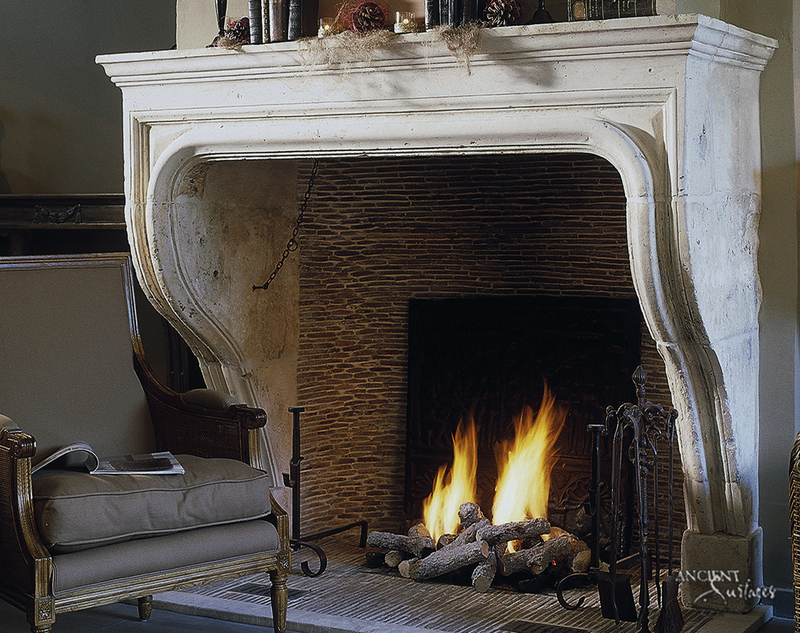 Let it rain snow and hail outside so our mantels can warm you up with style. There is nothing better than a cup of hot coco in front of a warm fire after a long day in the cold! 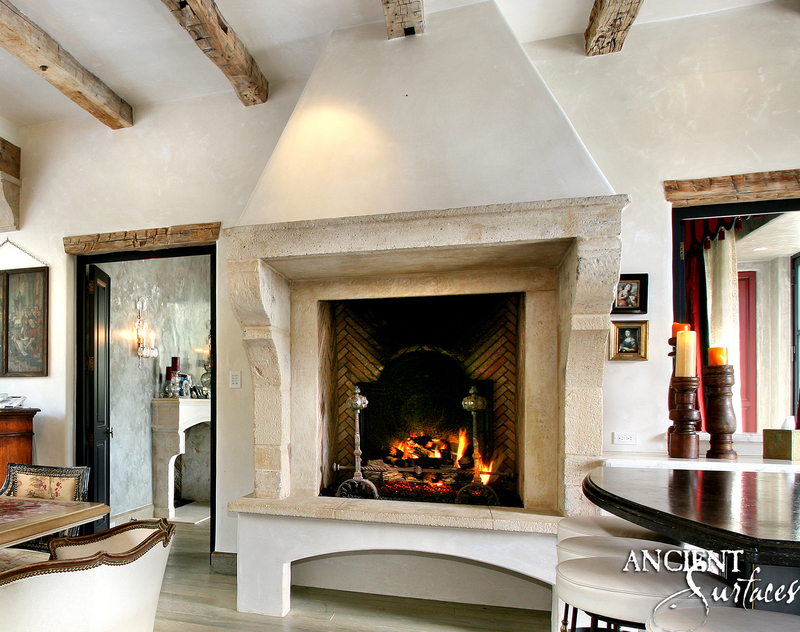 Our fireplaces are custom-designed to accommodate you and your loved ones. Thinking about having some peace of mind and a good read? 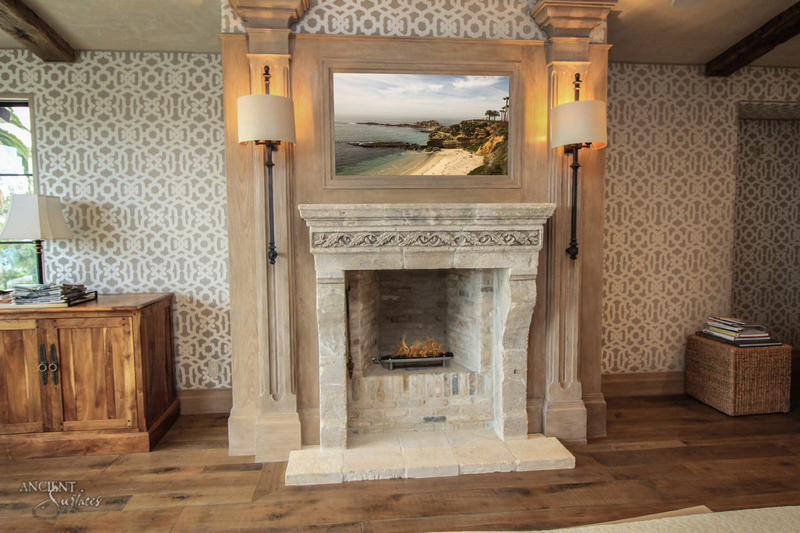 Where else then around a stone state of the art fireplace. 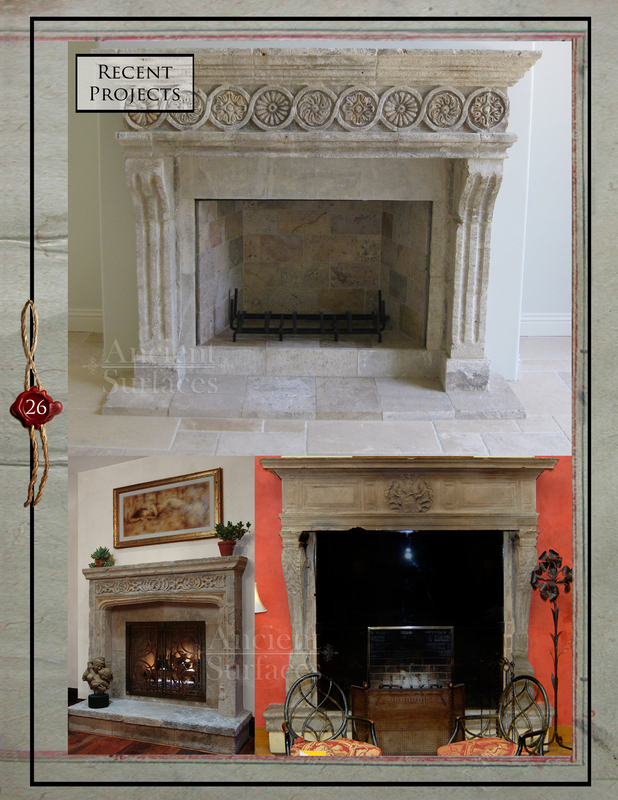 Scroll through the different fireplace designs and let yourself fall in love in our stone mantels, guaranteed to keep you warm. 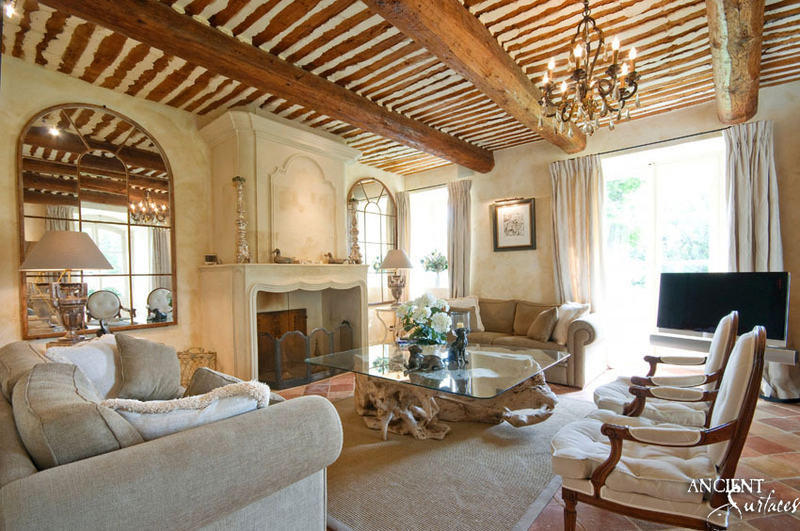 French Rustic mantel fireplace vignette in an exposed wood ceiling living room. 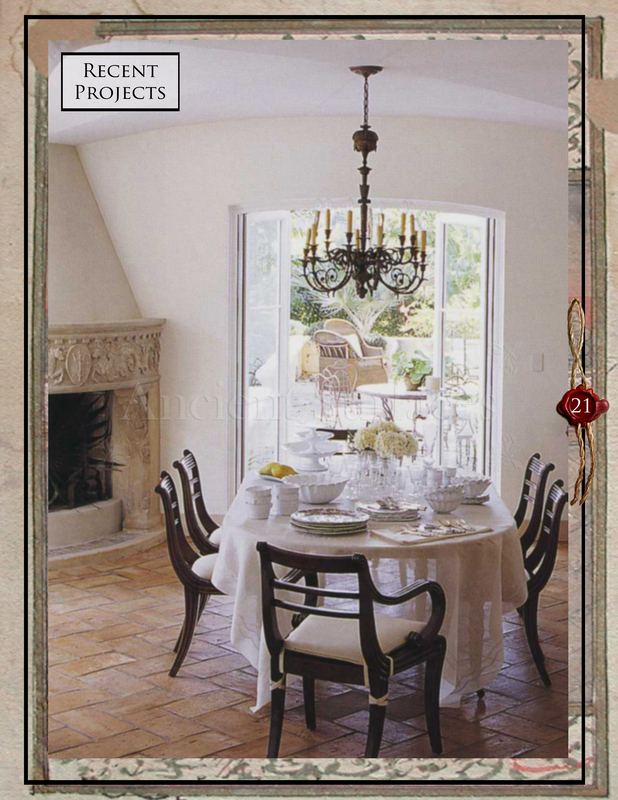 A French-Victorian mix design will throw your heart and mind into a wonderful world of “make believe” right in your own home. A roaring fire warms up the living room, with green and white detailed throw pillow as a compliment to the glowing embers. Limestone Coats of Arms emblems, antique limestone flooring, renaissance painting and classical Provence furniture were all enlisted for this ‘job well done’ design. 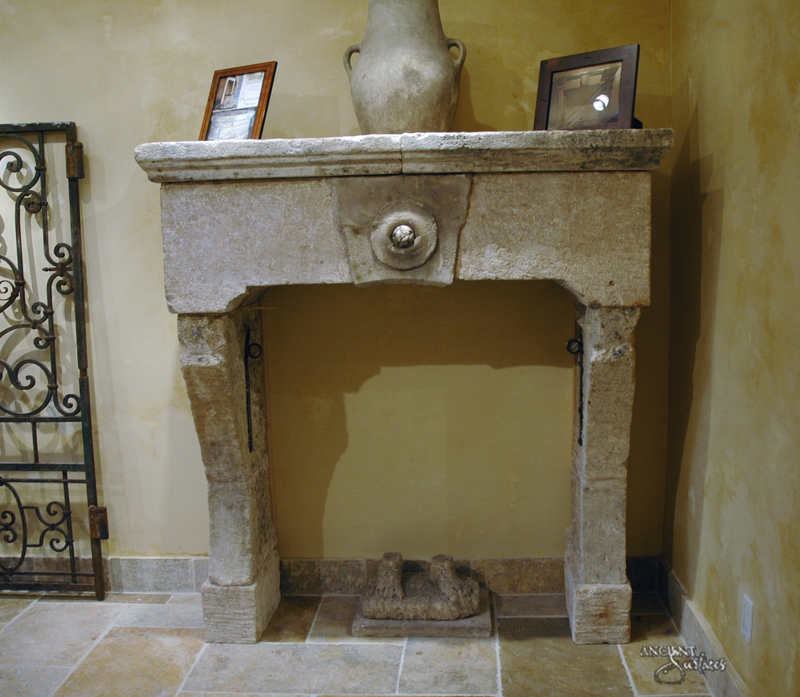 A captivating antique limestone fireplace that features an over mantle or a “trumeaux” as it’s called in French. 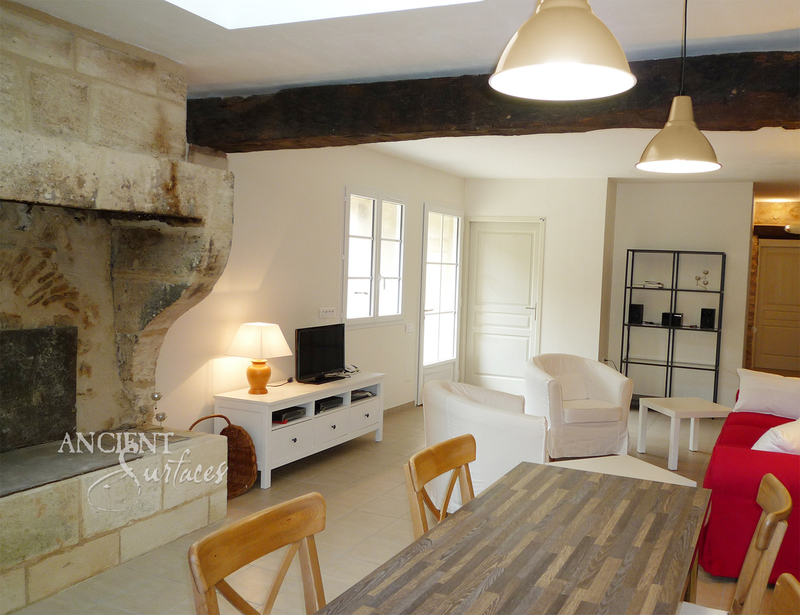 The fireplace back wall butts to the kitchen hood and stove on the other side, flanked by two classical French countryside reclaimed wooden doors. 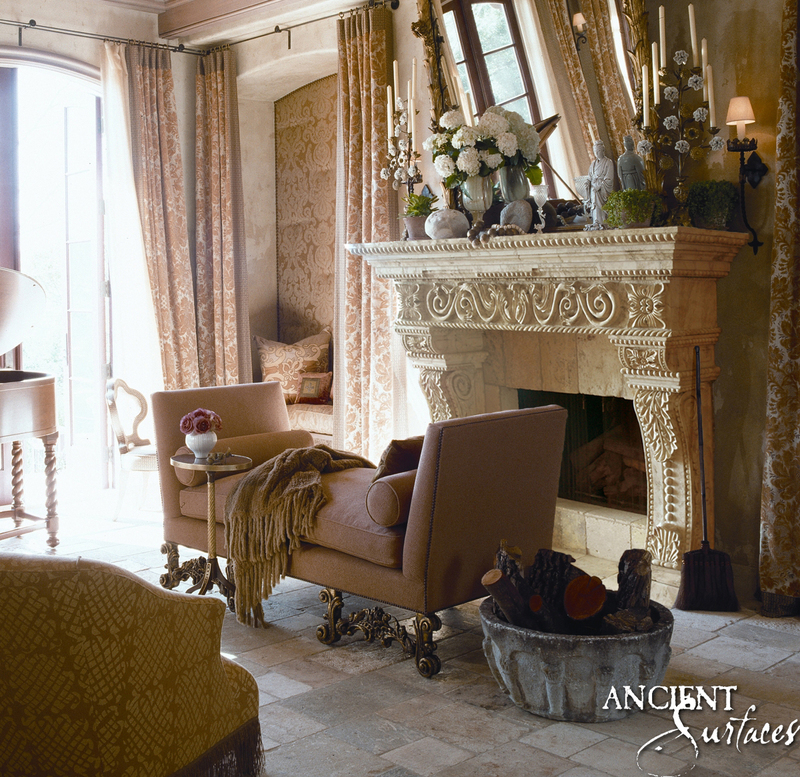 This French heavy carved majestic fireplace is the focal point in this master bedroom. 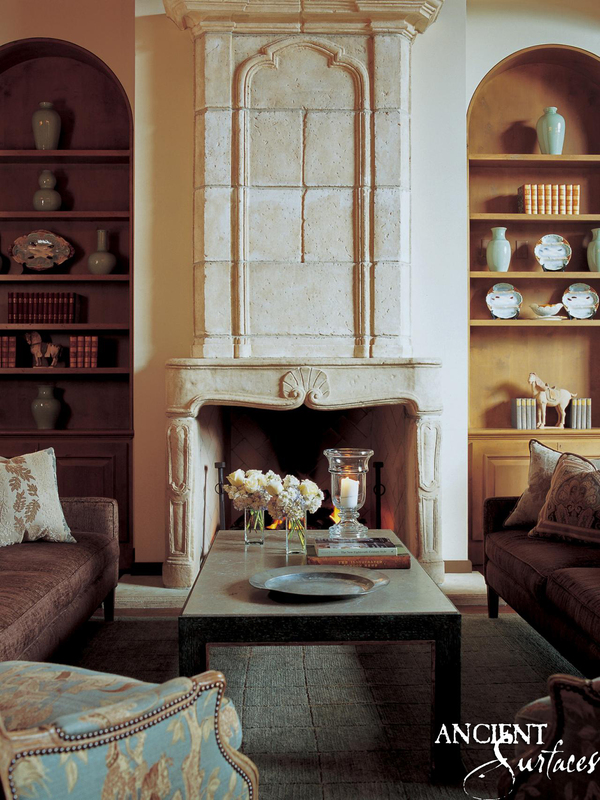 Beautiful reclaimed French Fireplace Mantel from the South of France installed in a cozy living room. 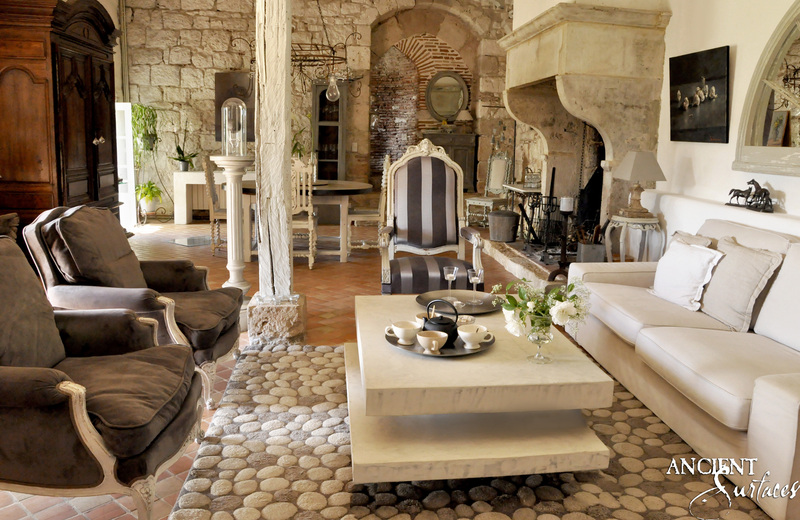 Rustic Provence look. Each architectural element in this picture has a story of its own and has witnessed a different angle of our rich human history. 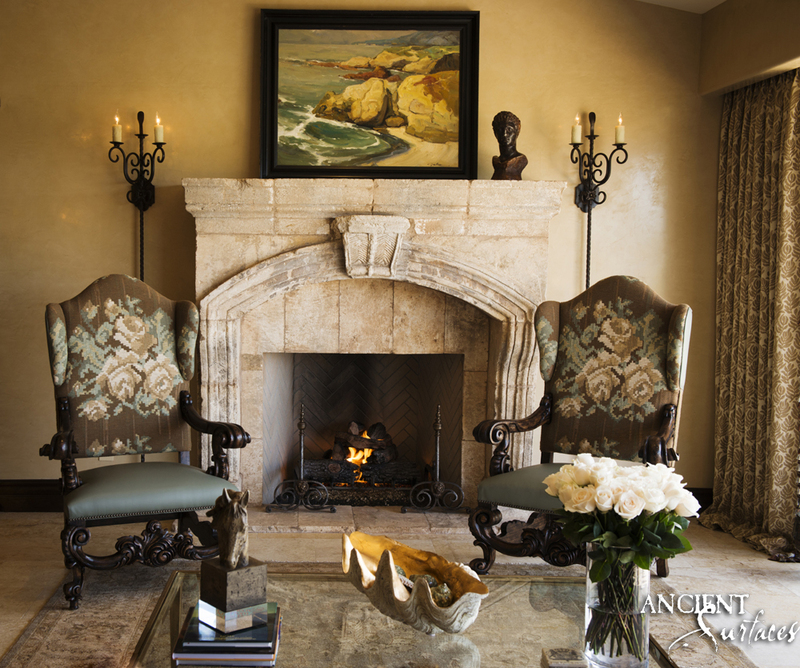 The Combination of antique chairs, basalt table and stone fireplace seem to just work flawlessly together. The various indoor plants next to the mantel look perfect in their weathered urns. 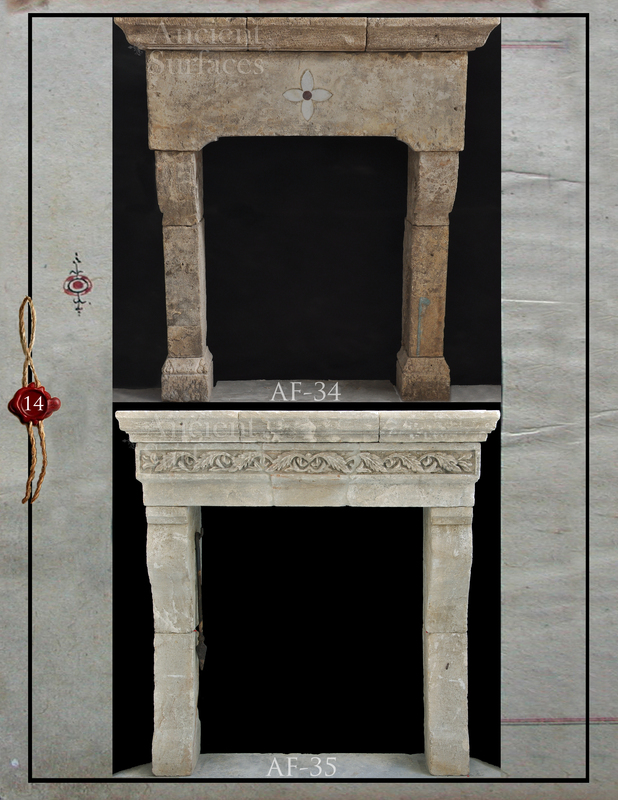 A simple and clean line Antique Fireplace Mantle with Over mantle by Ancient Surfaces. 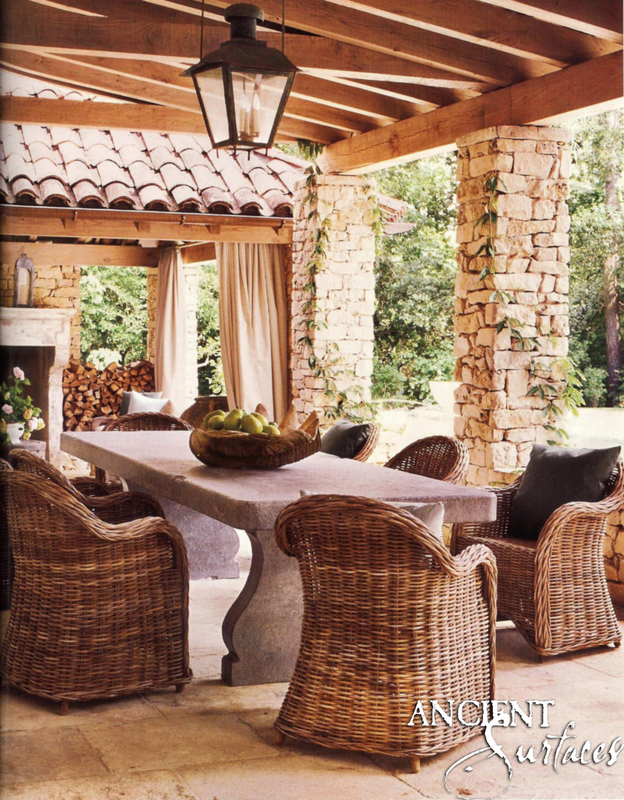 Old World Mediterranean, Italian home decor with a wide open indoor outdoor setting. 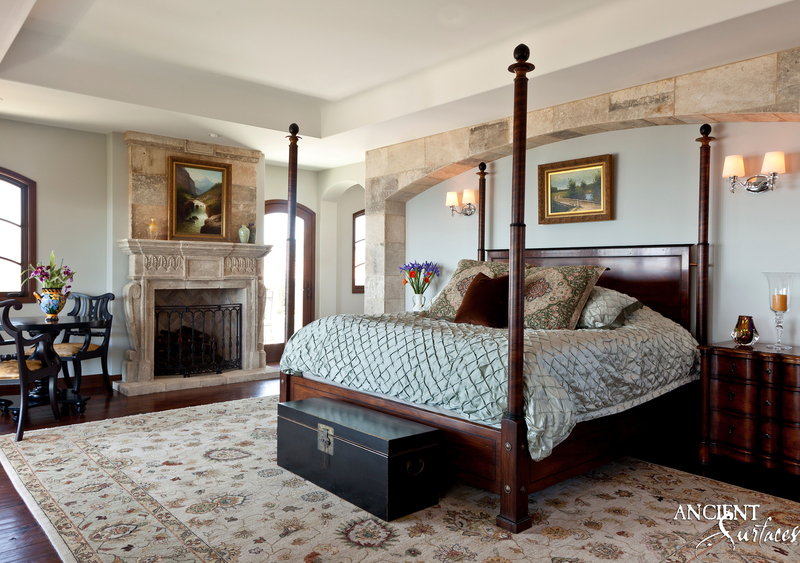 A Beautiful Architectural Bedroom with an Italian Fireplace in a Laguna Beach Master Bedroom. 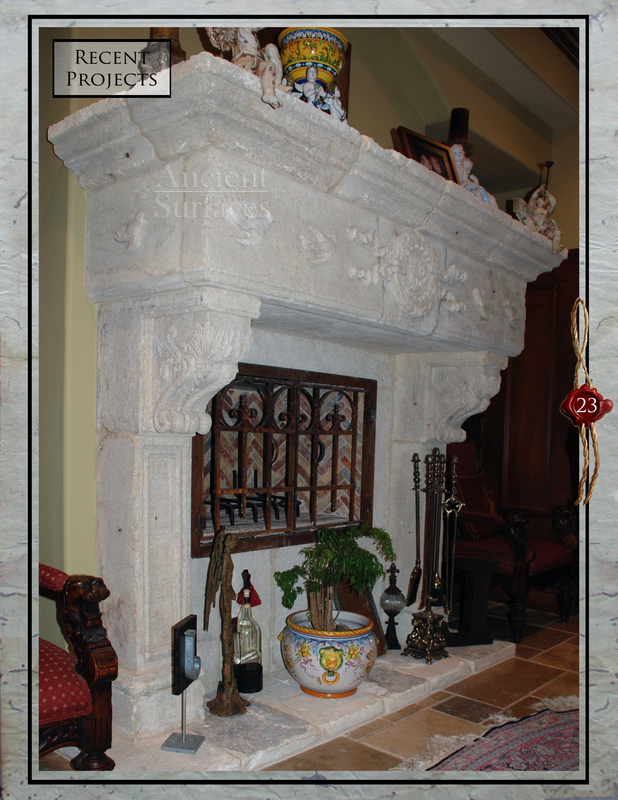 This Italian limestone fireplace mantel blends in perfectly with the room soft Italian countryside atmosphere and style. 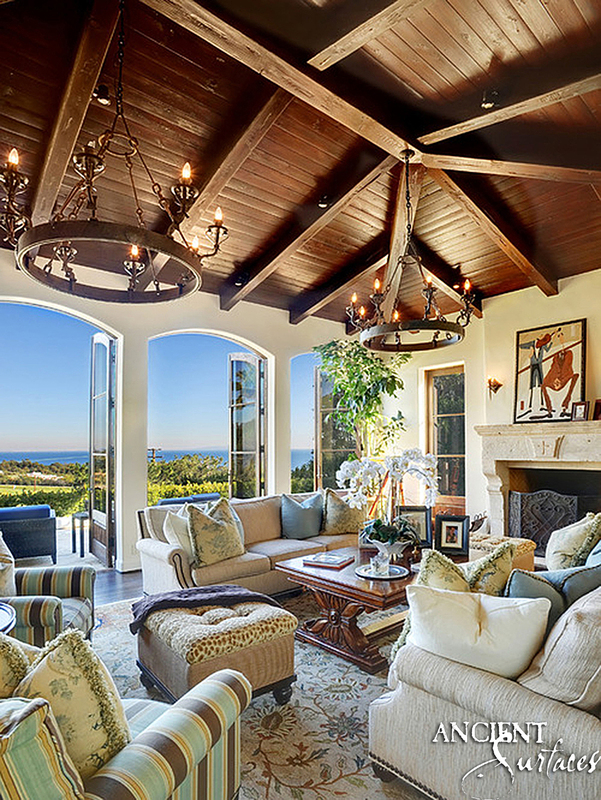 Gorgeous, cozy Italian Villa lounge room with a fully carved Italian fireplace that makes you want to just sit there and marvel. 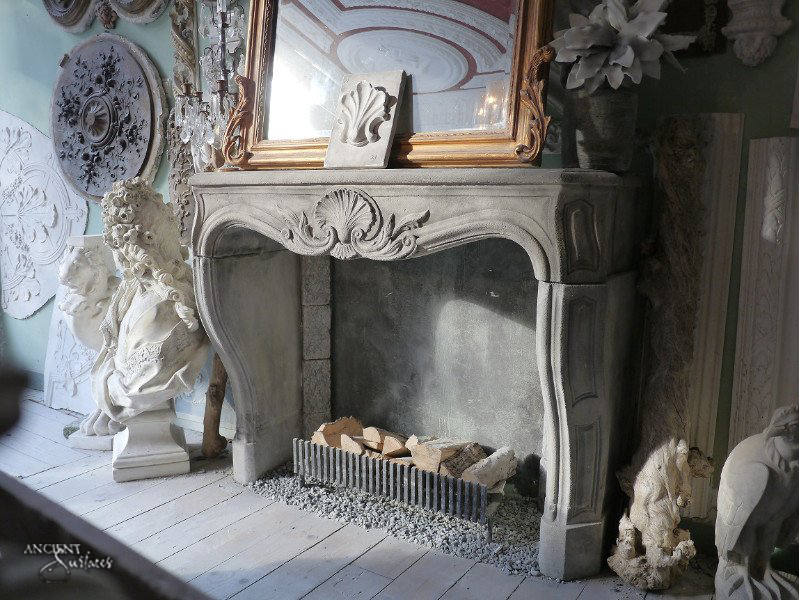 Hand carved French limestone fireplace mantel from the 17th Century. 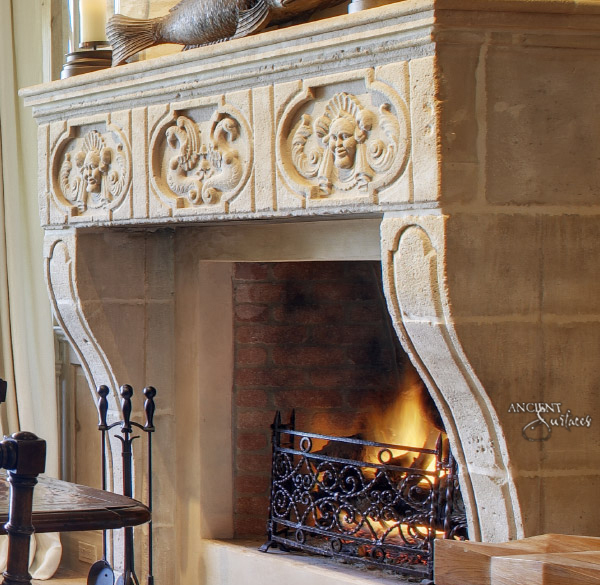 This small whimsical side fireplace nook makes you wonder how much attention to details has gone into the meticulous design of this beautiful and time honored estate. 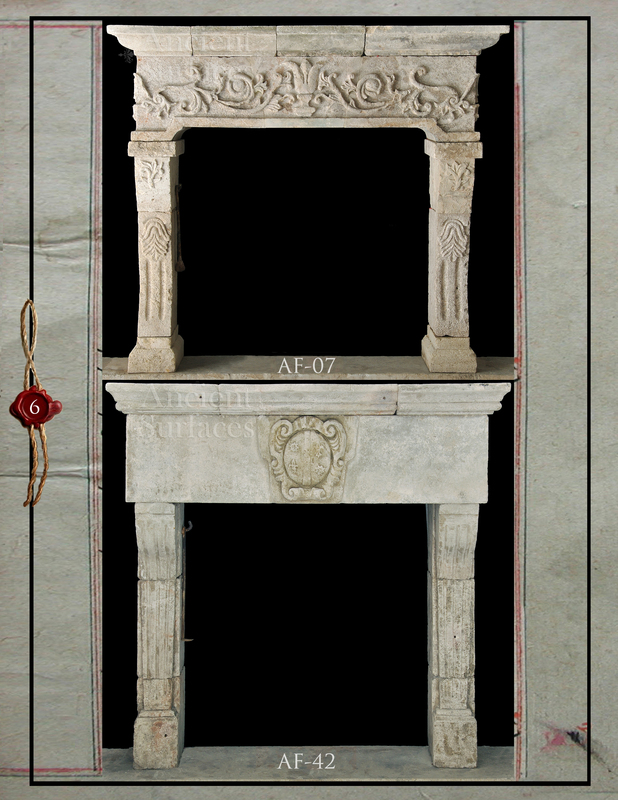 Another inspiring Antique Italian fireplace that is marked by the use of the golden ratio in its carving centuries ago. 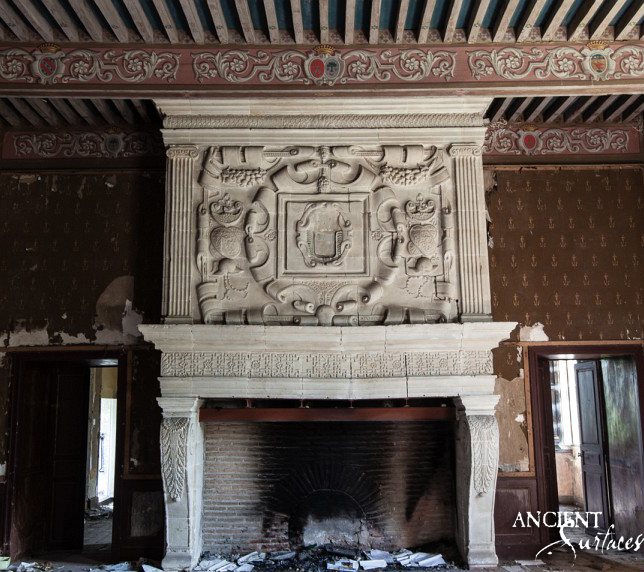 A beautiful 16th Century French fireplace with a sunning overmantle photographed during the renovation of this classical French castle. 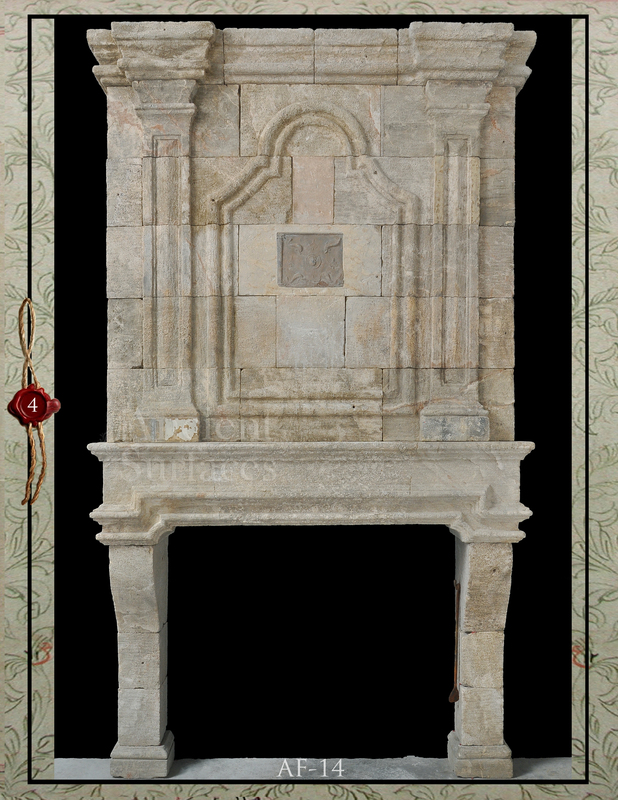 A Beautifully hand carved traditional 18th century Italian Limestone fireplace. 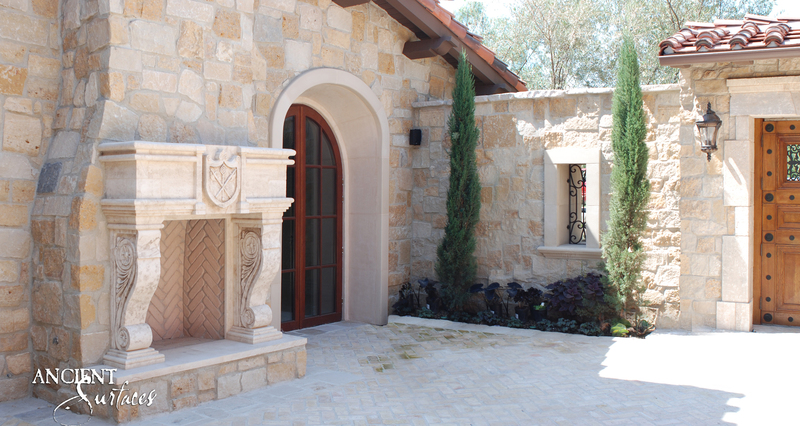 Are you having problems coming up with the right design ideas for your outdoor stone fireplace? Do you feel like what’s out there on the market looks so cookie cutter and low quality that it could cheapen instead of enrich your backyard experience? 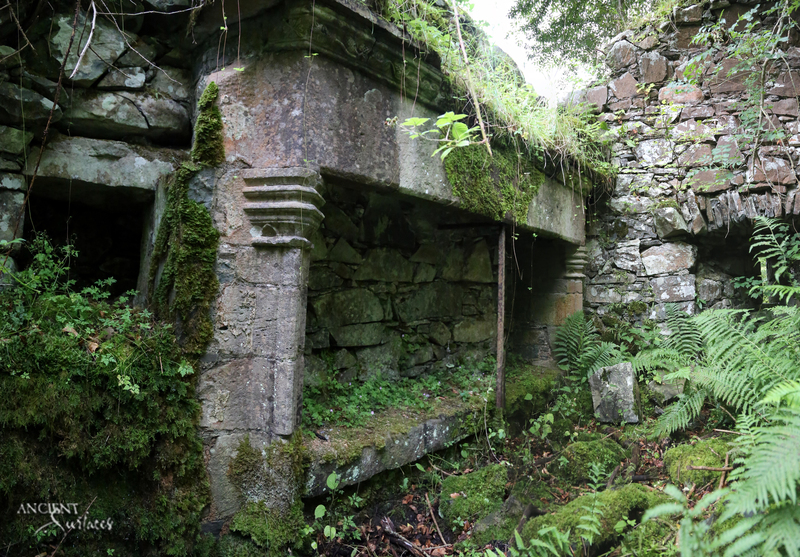 If you are hoping to include a unique looking stone fireplace into your wild outdoors you just might be in luck. 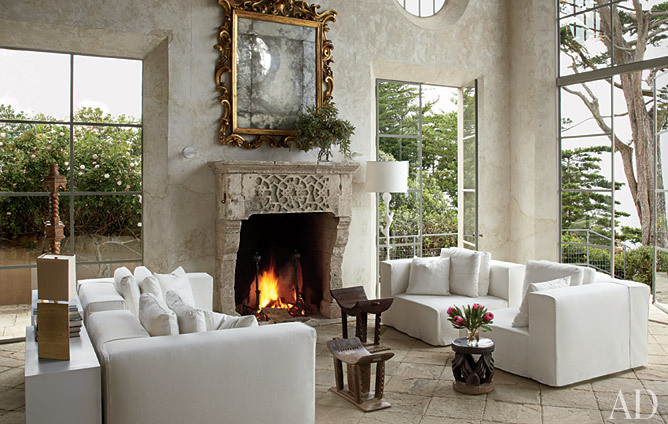 Installing a real elegant stone fireplace could be a step in the right direction. 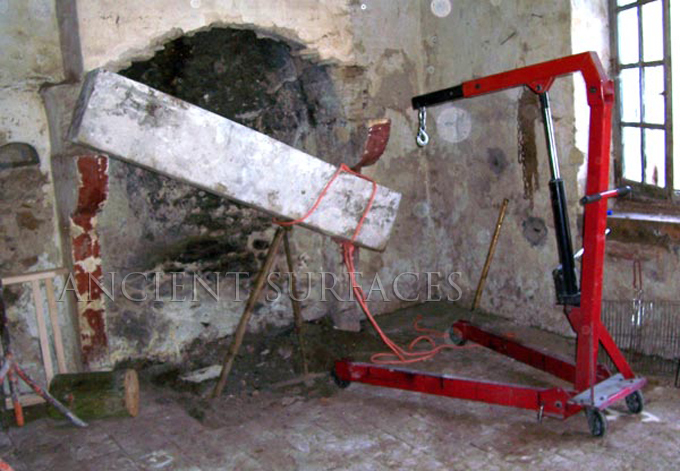 Tired of the same ole copy paste Slam Depot stacked stone ‘fireplace kits’ that are “so easy you can install them yourself”?! They are quite frankly the saddest thing to look at and are littered across the dot-com world that import all sorts of substandard goods guaranteed not to impress you nor enrich your outdoor living experience. 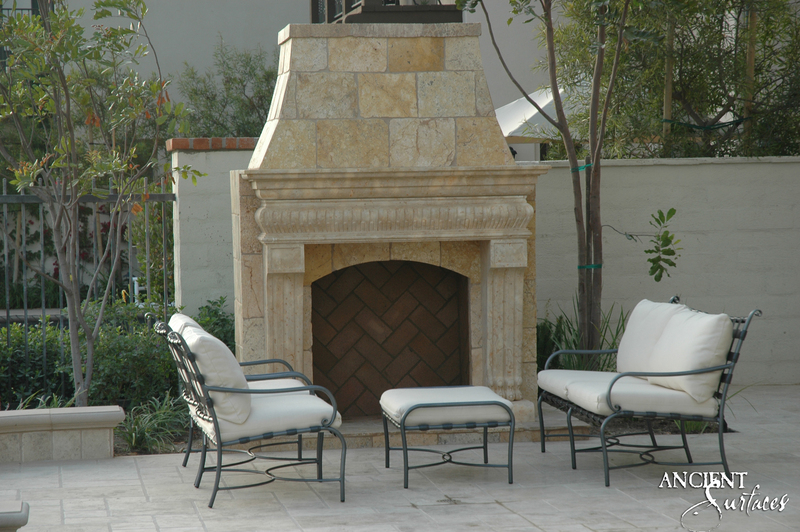 Here are some real Outdoor Stone Fireplace Masterpieces that deserve to be in your Backyard and should be worthy of setting the stage for your upcoming best memories you’ll be creating with your love ones. 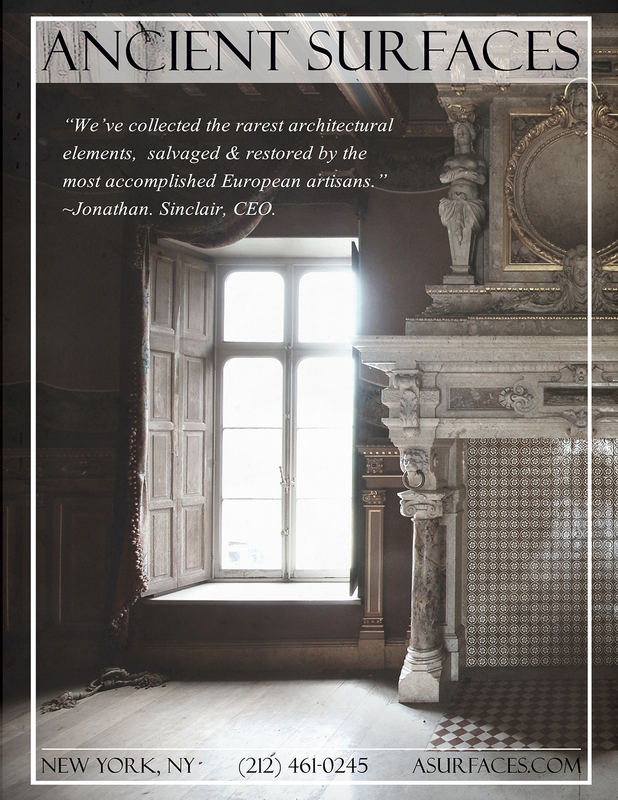 Sometimes functional items are designed so beautifully that they blur the line between architecture and art. 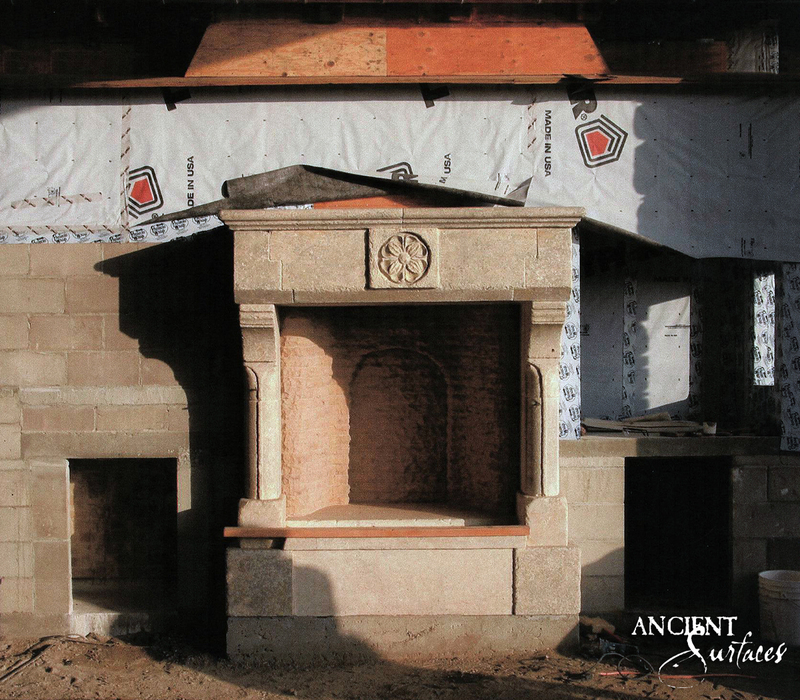 The stone fireplace surrounds in our collection are beautifully hand carved ancient works of art. 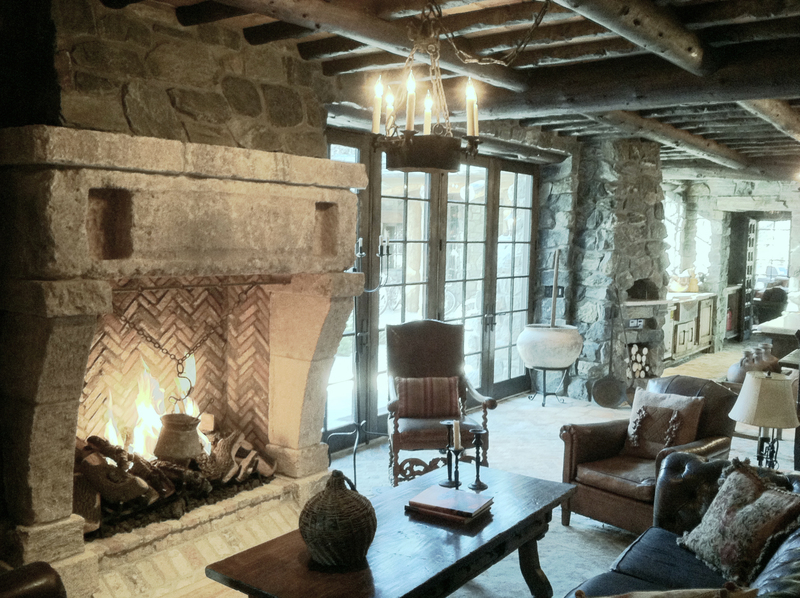 As the evenings growing colder, no wonder many of us start turning on the glow of their beloved fireplaces. 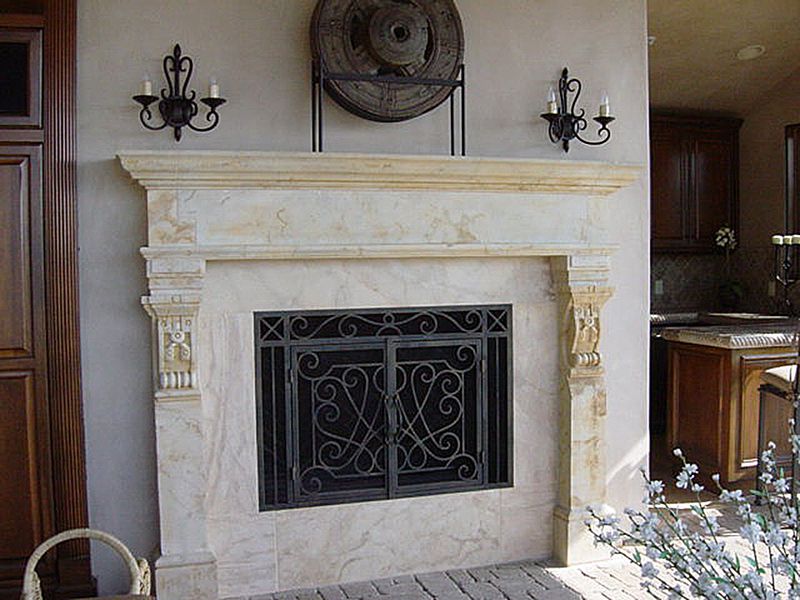 Many of us think that it might be a little too late to remodel their fireplaces and replace them with the real deal. Well, think again! 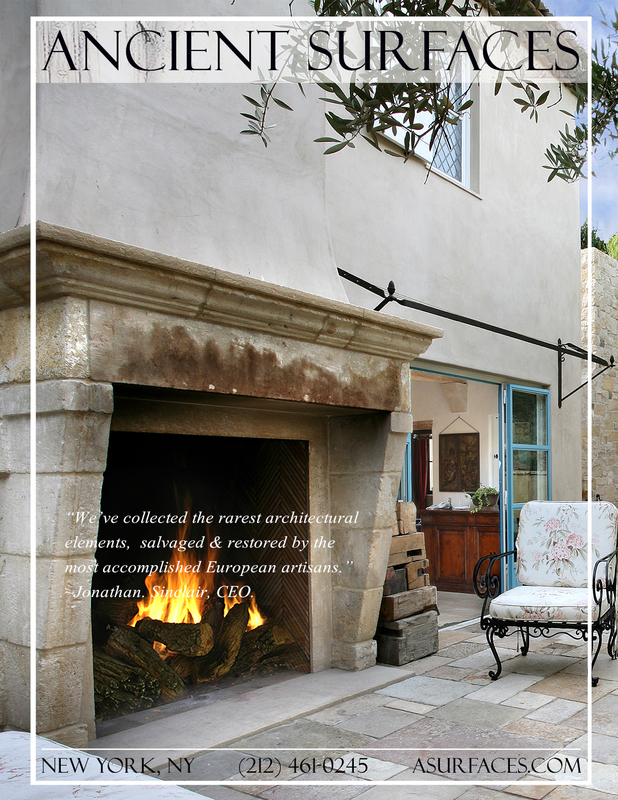 With some extra motivation fueled by your desire to enjoy your winter season in a European flair, you can have your own masterpiece. Our primal connection to art and fire have gone hand-in-hand ever since cavemen created art on the walls of caves by firelight. 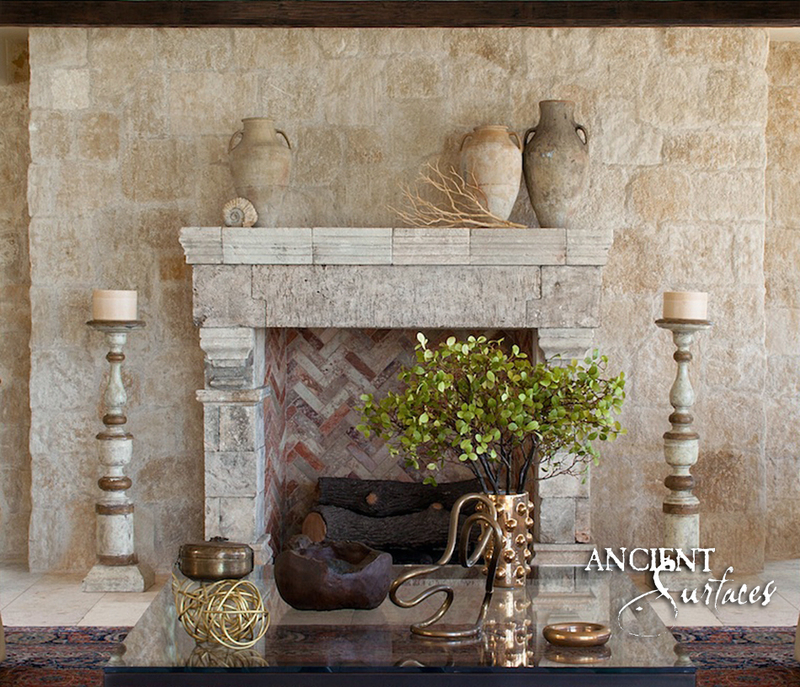 This mantel fireplace gives a feeling to be simultaneously ancient and modern. 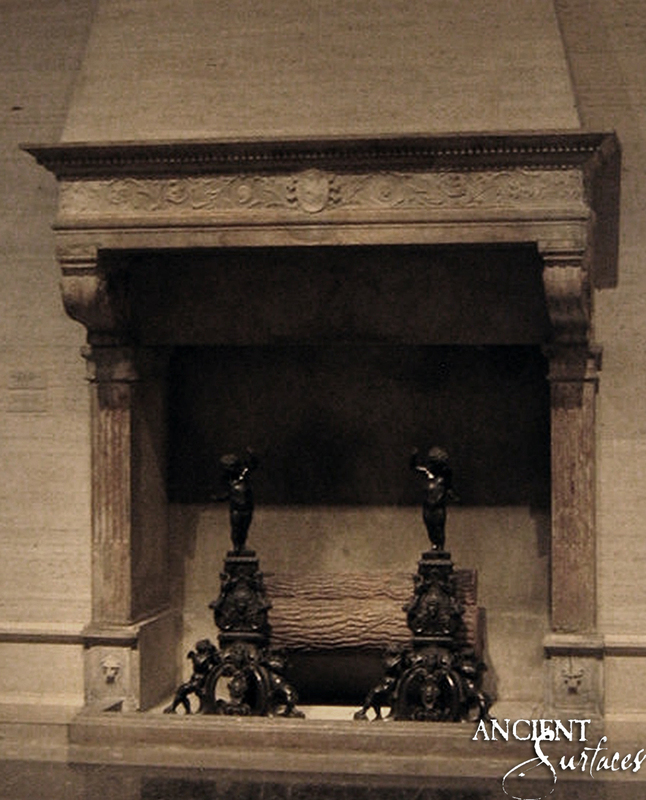 The sculptural elements of this classic fireplace rival anything I saw in the castles of Europe or France! 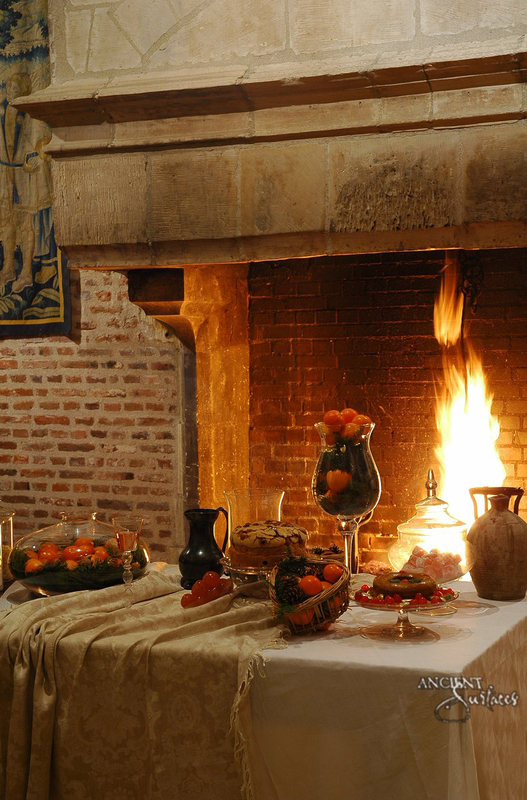 It makes you want to relax in front of the fire while listening to Bach’s “Brandenburg Concerto Number 3 in G Major.” That music always makes me feel uplifted in spirit, and I think it fits the fireplace. 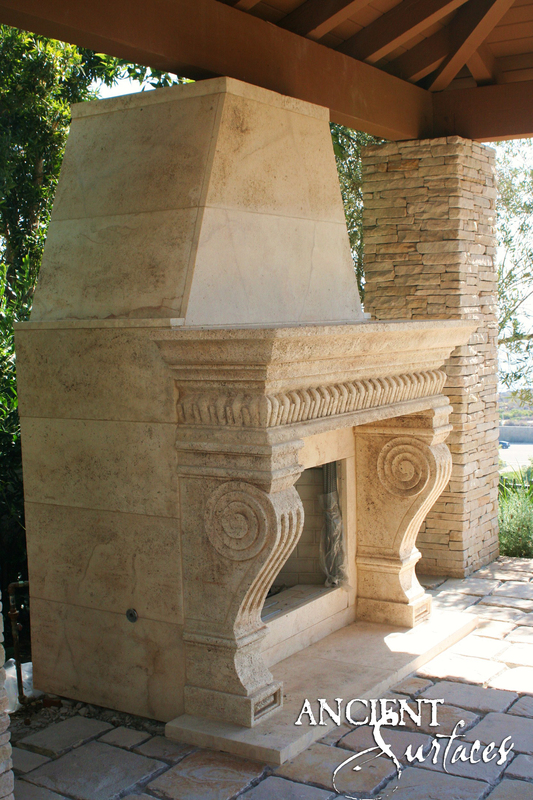 This amazing fireplace was custom designed for the client and hand carved from stone. I would listen to Bach again, but this time it would have to be “Tocata and Fugue in D Minor,” a much heavier piece. 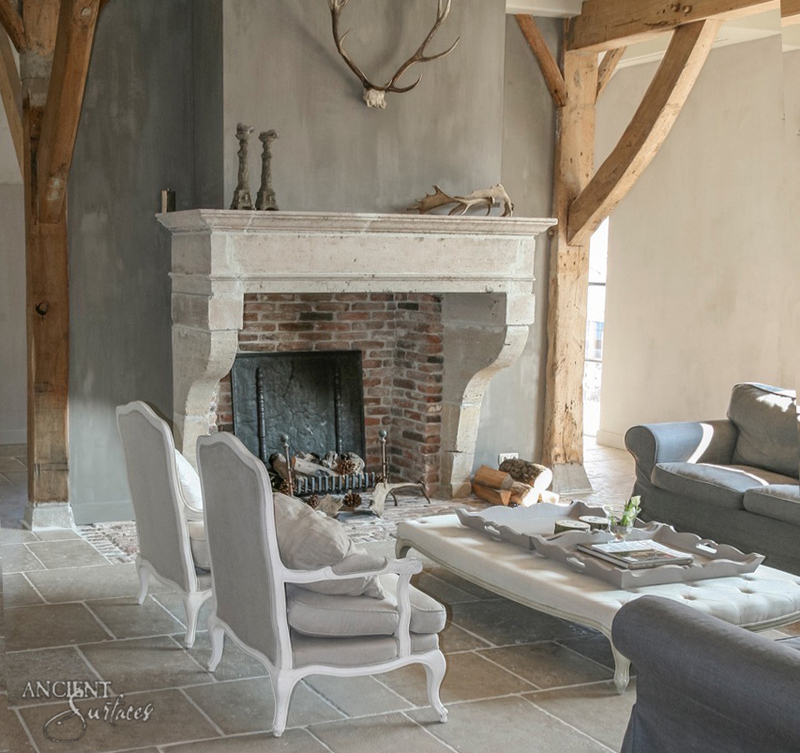 This stunning French limestone fireplace mantel was realized in the Provence style and was the main feature of this frugal French farmhouse in Provence. 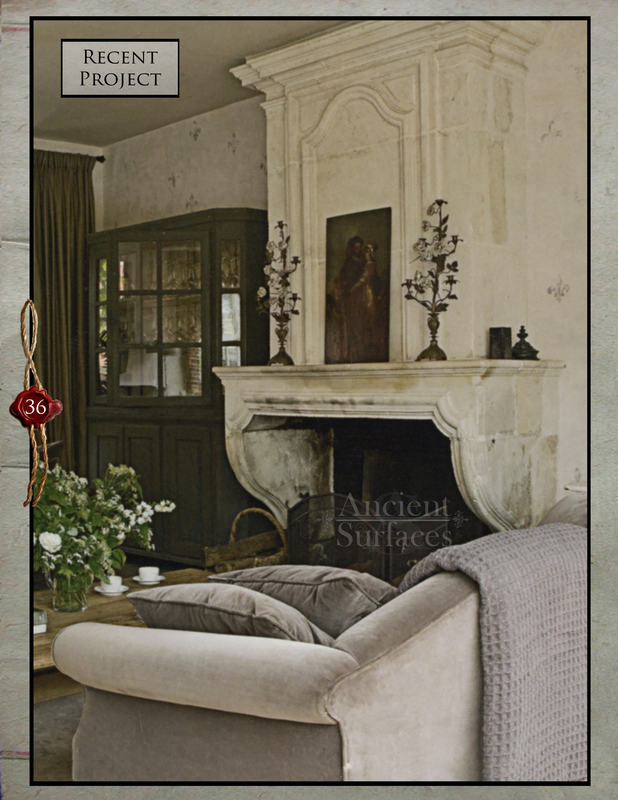 This simply designed French fireplace making tradition of the 18th and 17th centuries. 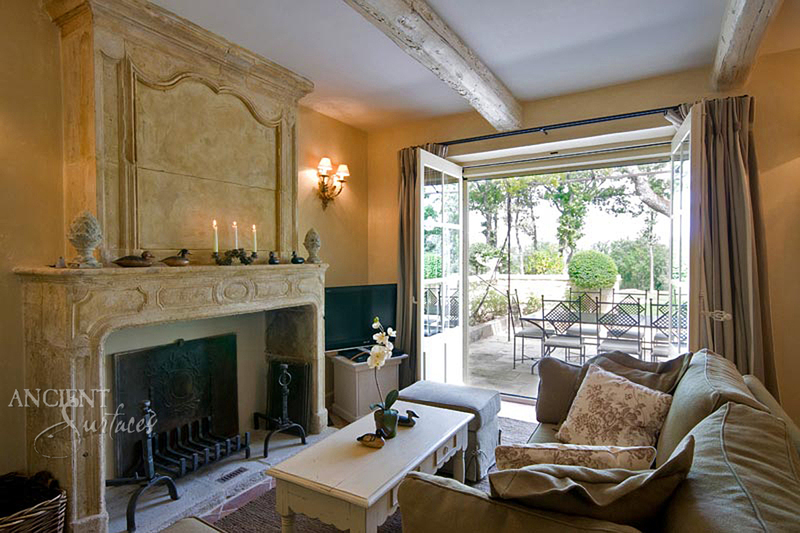 Its classical simplicity speaks volumes about the period in which it was conceived. Selecting the right piece of stone and choosing the direction of placement shows off a stunningly beautiful natural work of art. It’s an ancient piece of stone, yet it reads like a contemporary abstract painting with all the artistic carvings. 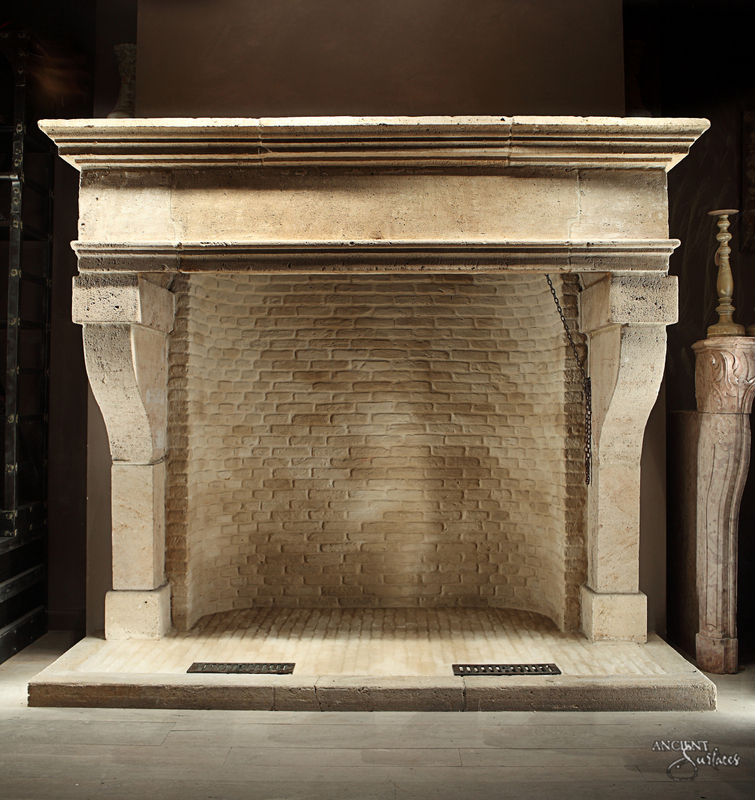 This is a unique Louis XV limestone fireplace from Provence dating back to the 17th century. 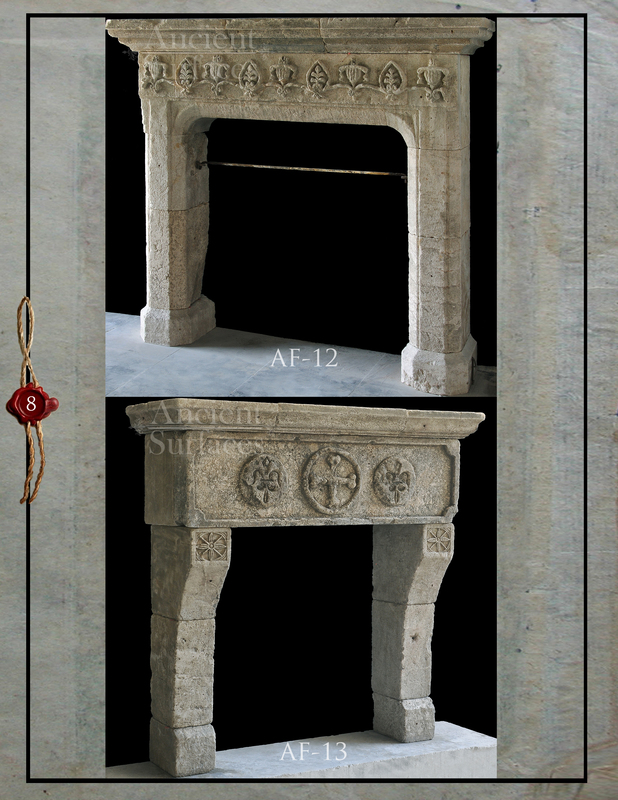 Baroque and Medieval inspired bedroom fireplace with a modern flair. 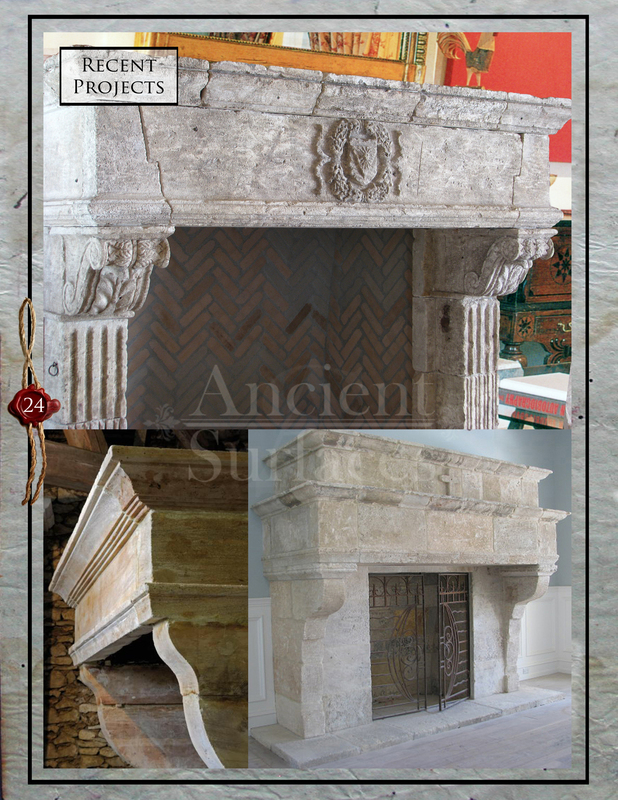 This Online catalog selection featuring some of our captivating antique limestone fireplaces were taken from our own printed fireplace catalog from 2011 to 2016. 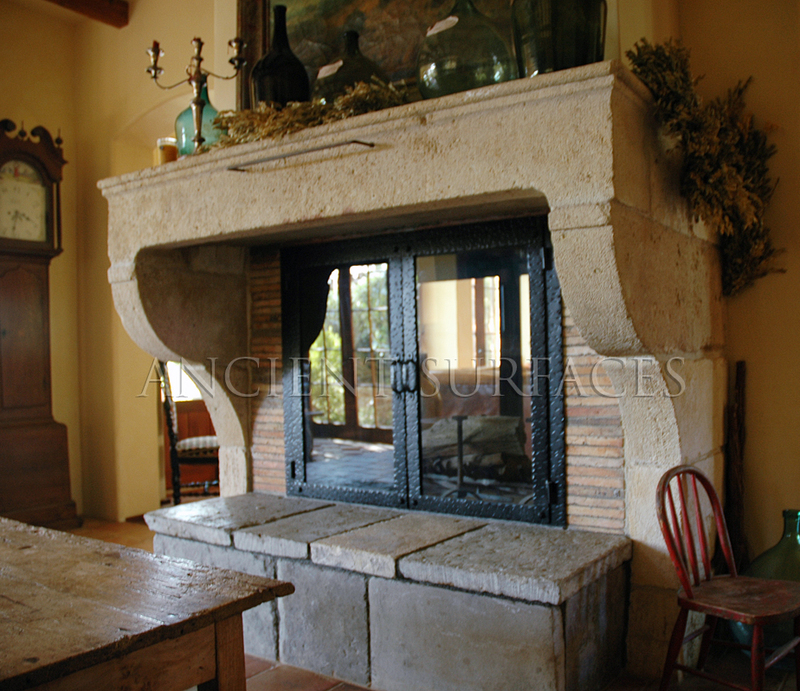 One of a kind antique limestone fireplace hundreds of years old reclaimed and restored by hand, shipped from Spain to a French castle in the Dordogne region close to the Limousine national forest. 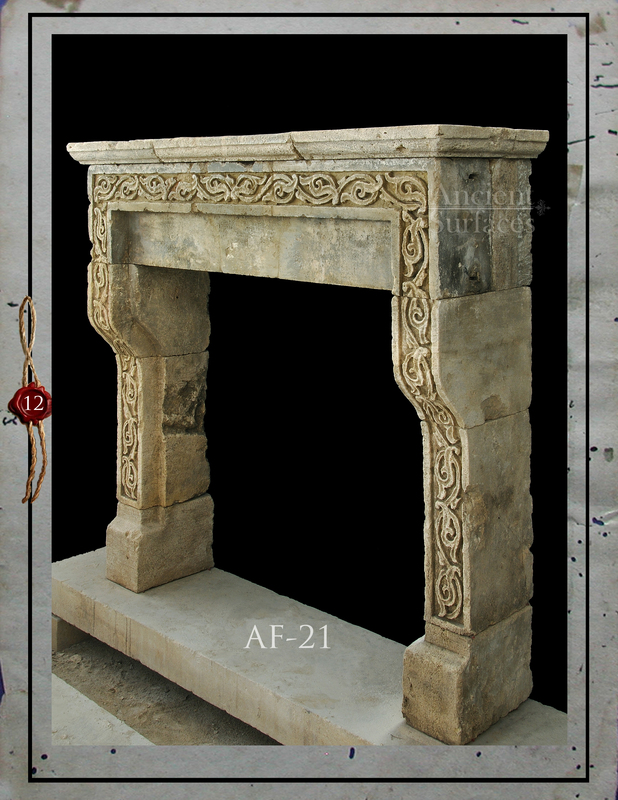 A captivating antique Limestone Fireplace that features an over mantle or a ‘trumeaux’ as its called in French. 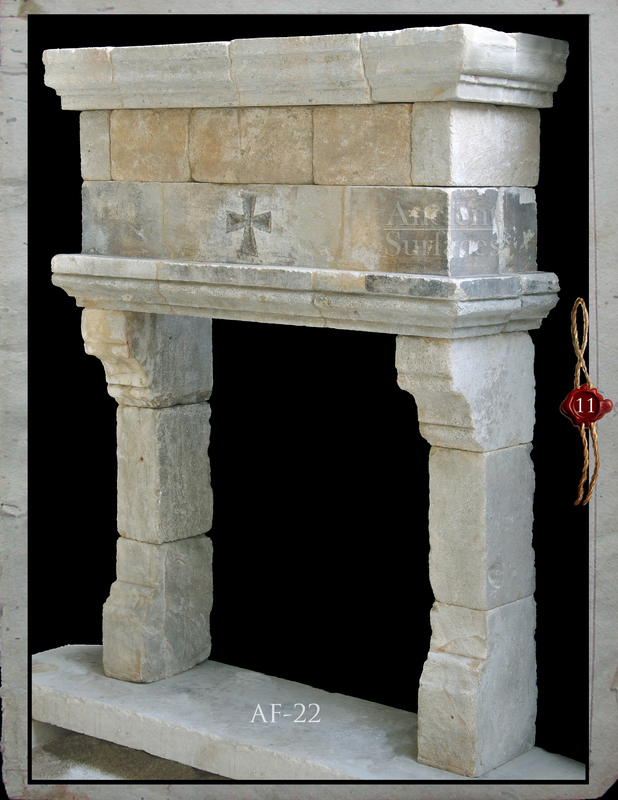 A lovely antique stone fireplace with an etched Cross motif on its midsection. This Cross is known as the Maltese Cross. 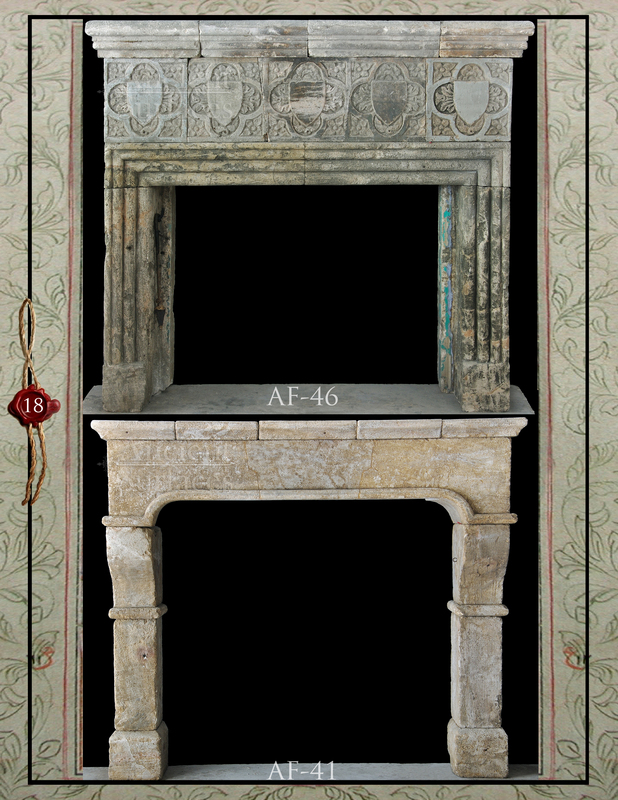 A finely carved crest of two lions flanking a Medici vase is the main characteristic of this antique 15th century fireplace. 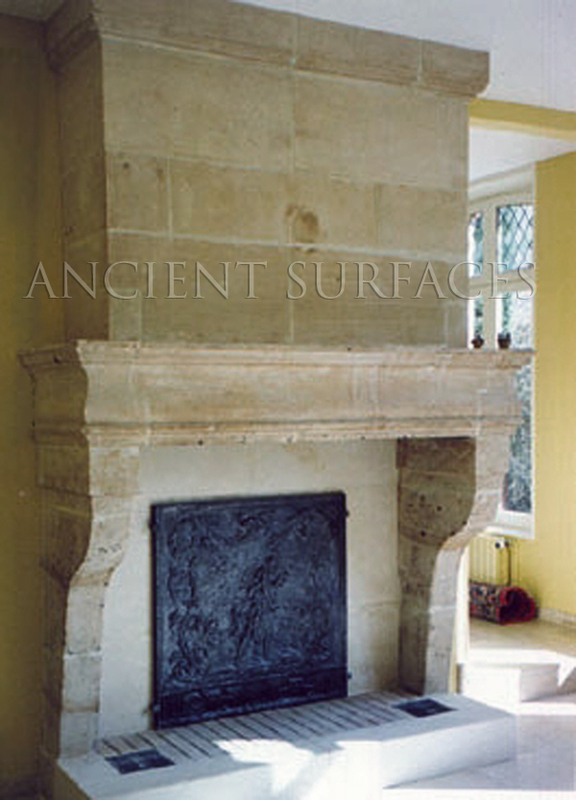 A beige limestone antique fireplace dating back to the 17th century. 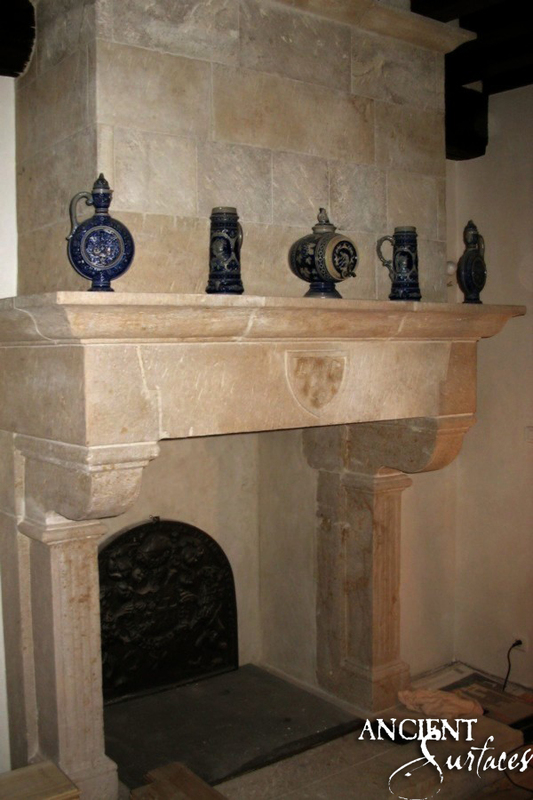 This lovely stone mantle was restored to its formed glory by the capable hands of our professional artisans who had to change and beef up its top shelf and extend its legs. 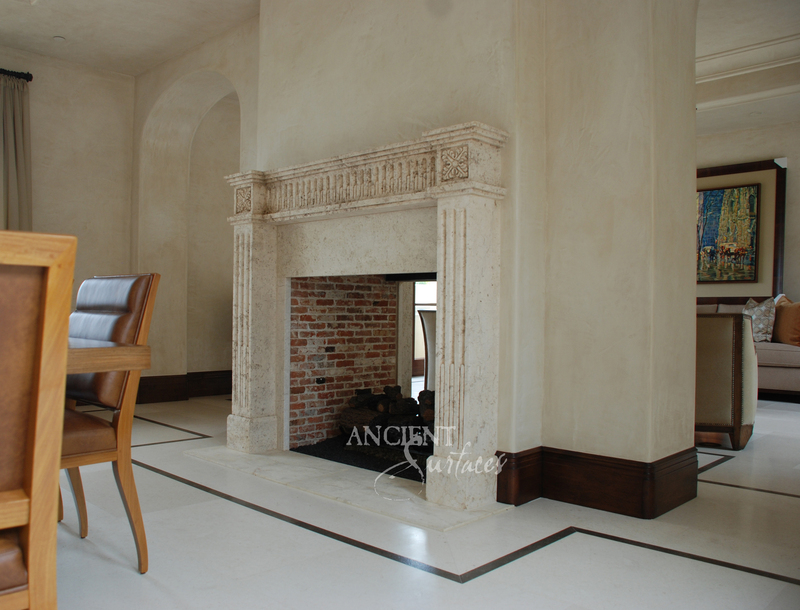 This antique Italian beige limestone fireplace was supplied, restored and installed for this charming private Italian Villa. Over the years, the list of our clientele has grown into the thousands and reads like a Forbes 500 list. 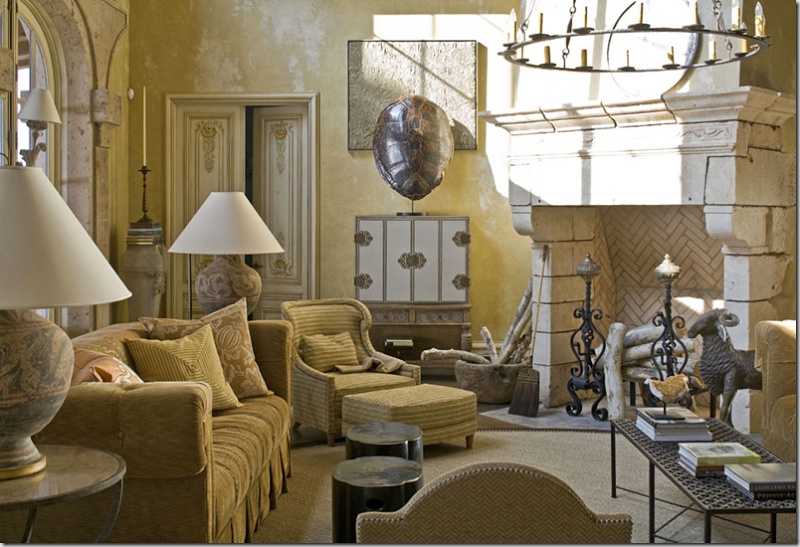 Both our clients and competitors admire the rarity and uniqueness of our one of a kind Antique Fireplace Mantles that we salvage and carefully (and sometime painstakingly) restore back to their original splendor without defacing the time honored patina that those pieces have acquired during their temporal journey since their hand carving centuries ago. We are trying to move with the times by making our entire Yard stocks becoming digitally available for online viewing. This massive undertaking required tens of thousands of man hours worth of documentation, data entry, archiving and classifications. We’ll be keeping everyone updated on this herculean undertaking as the months or even maybe years role by! 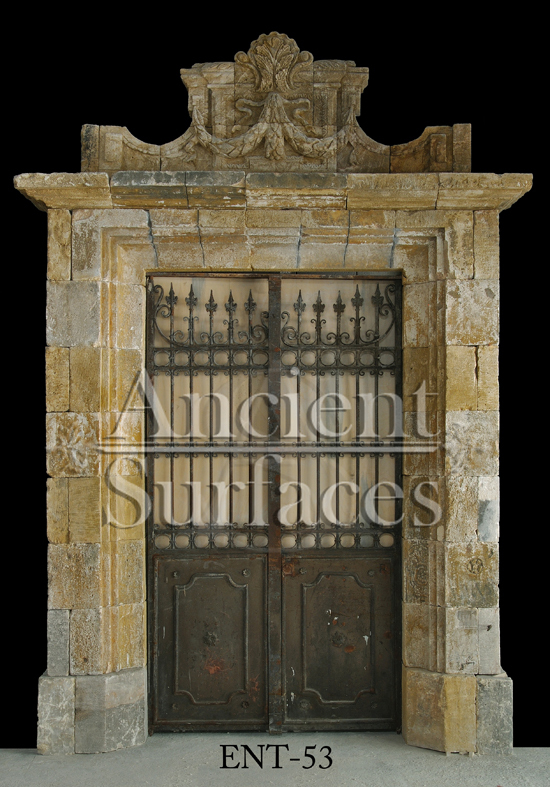 To learn more about those fascinating and unique architectural gems as well as their hand carved exact replicas feel free to please contact us through our website at Ancient Surfaces. 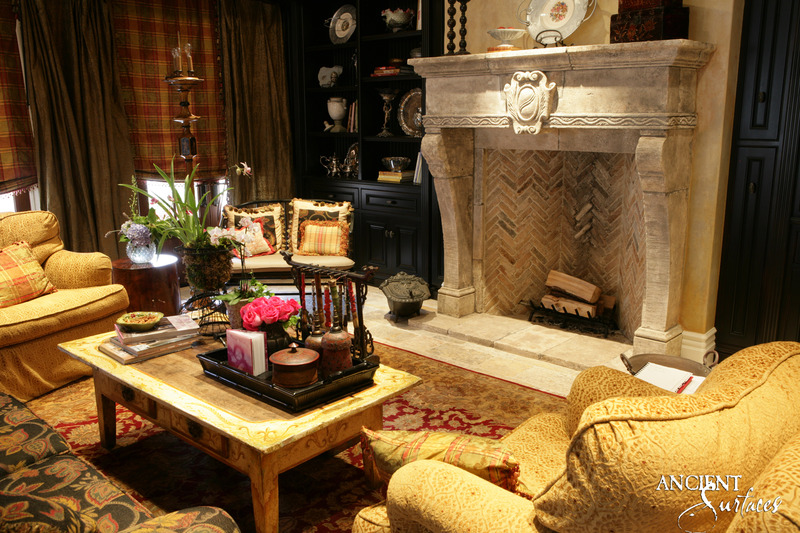 Antique fireplace mantels are important pieces of furniture. 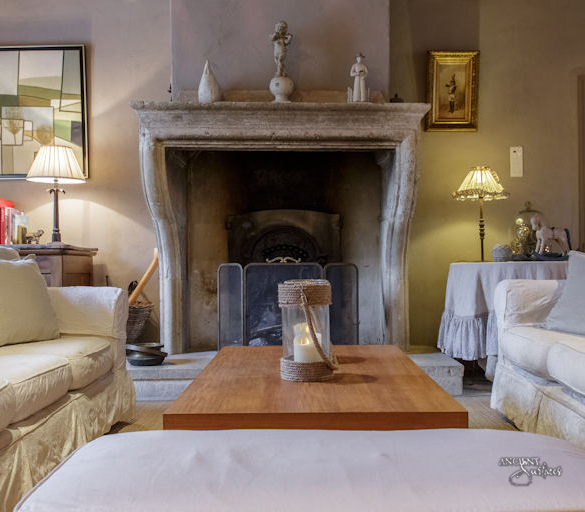 They provide a classic look to the living room, warmth and coziness in the bedroom, or a meditative and unwinding therapy by the poolside patio. Chateau Lyon French Countryside Castle on Lake Norman. 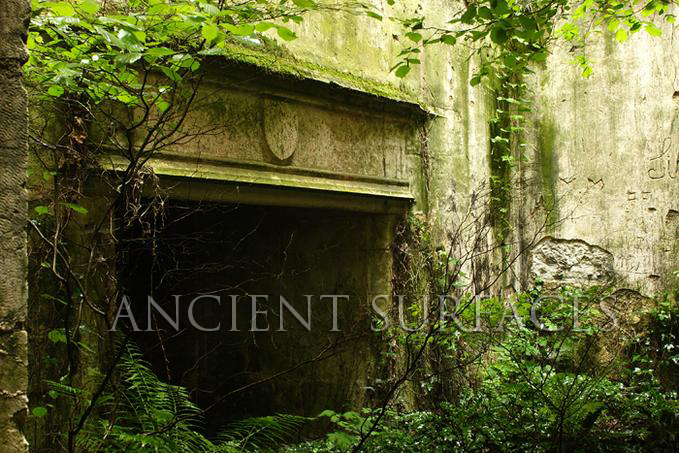 By Ancient Surfaces, Barry Dixon 2008. 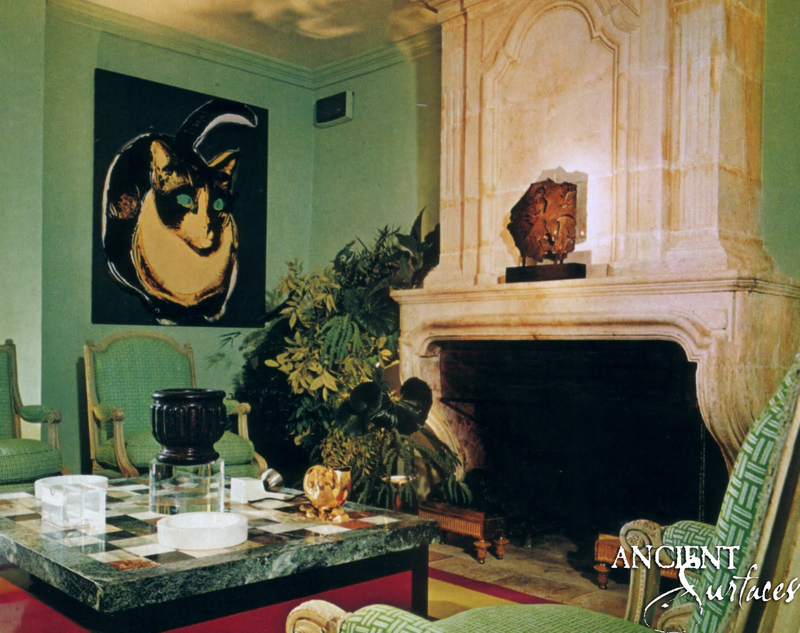 These mantels have stood the test of time unlike their brand new counterparts. Also, a good antique reclaimer might offer an arsenal of refurnish antique accessories to complement the whole antique mantels ambiance that you’re trying to create in your home. 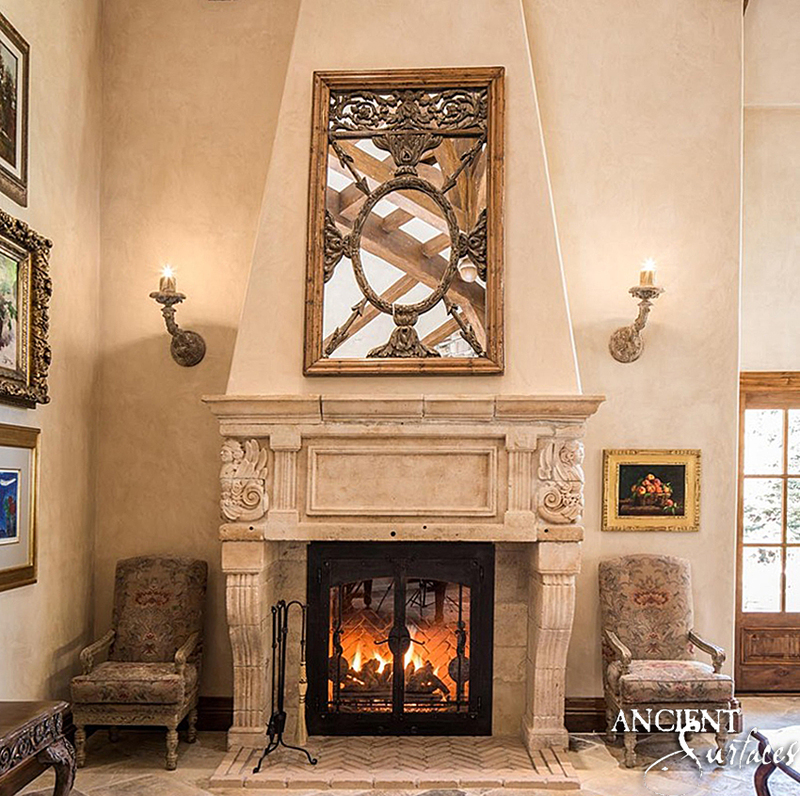 Private home with an Ancient Fireplace Mantle in Paradise Valley Arizona, Fireplace originated from Ancient Surfaces. 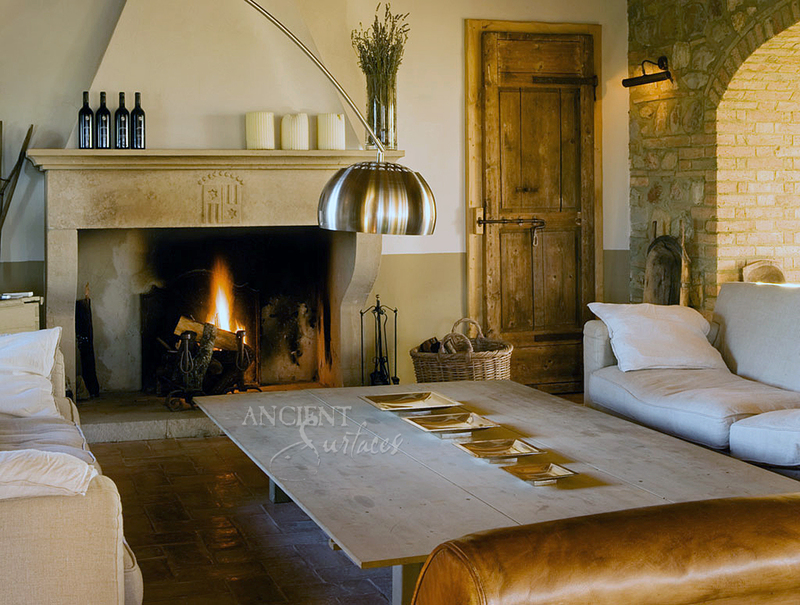 Such items include ancient metal gates, antique herringbone brickletts used to line the insides of the fireboxes, to the simple yet elegant and classic andiron and baskets that are salvaged from the 18 an 17th centuries. 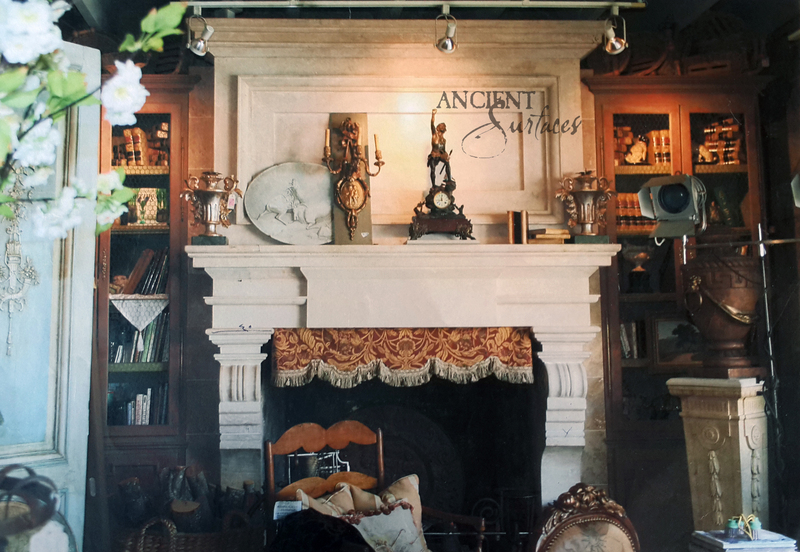 Antique Stone Fireplace by Ancient Surfaces, Luxe Magazine 2012, Florida. 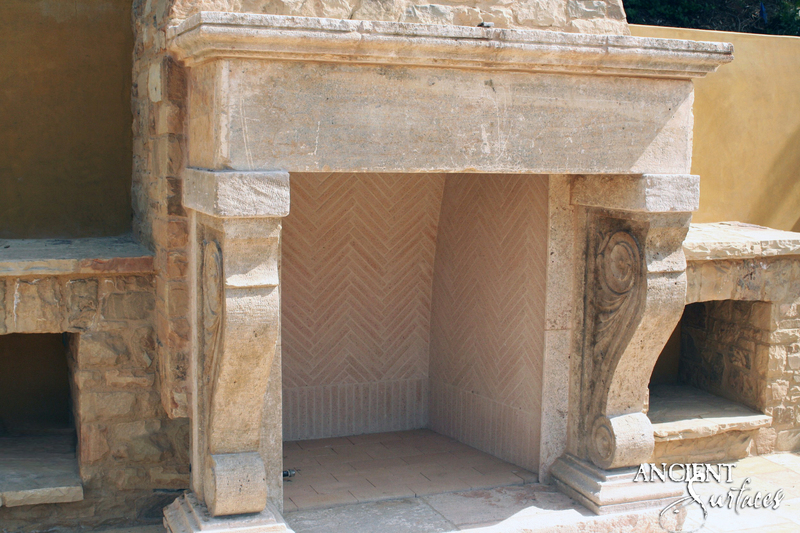 Thin Herringbone firebox. Classic timeless pieces from the Norman medieval, Italian and French Renaissance or Edwardian and Victorian eras are the best options to choose from. 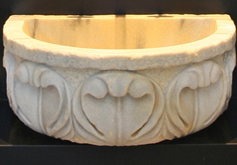 While choosing from a variety of ancient hand carved stone mantels, generally, those offered by dealers are mainly simple with the occasional corbeled legs to them like the French countryside fireplaces, or with a nice bolection frame or picture frame looking mantles that were common during the late British Imperial era. 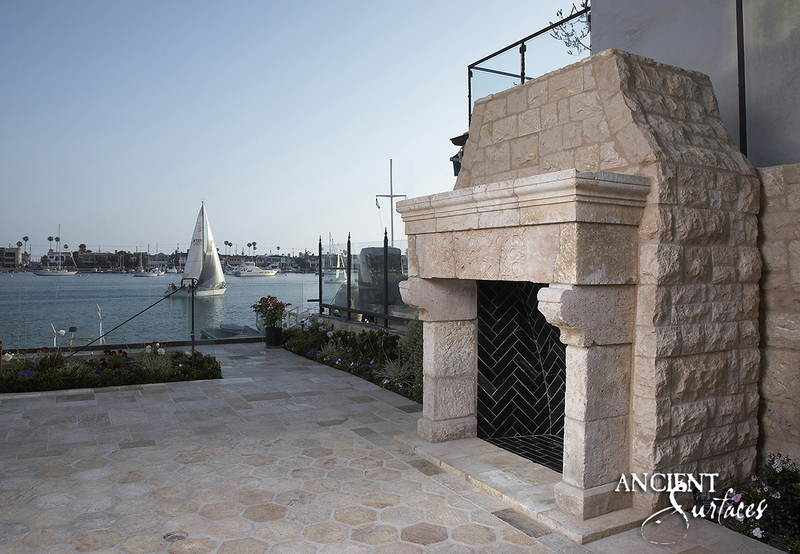 Reclaimed Medieval era antique stone fireplace installed in an outdoor open patio, Coastal California. 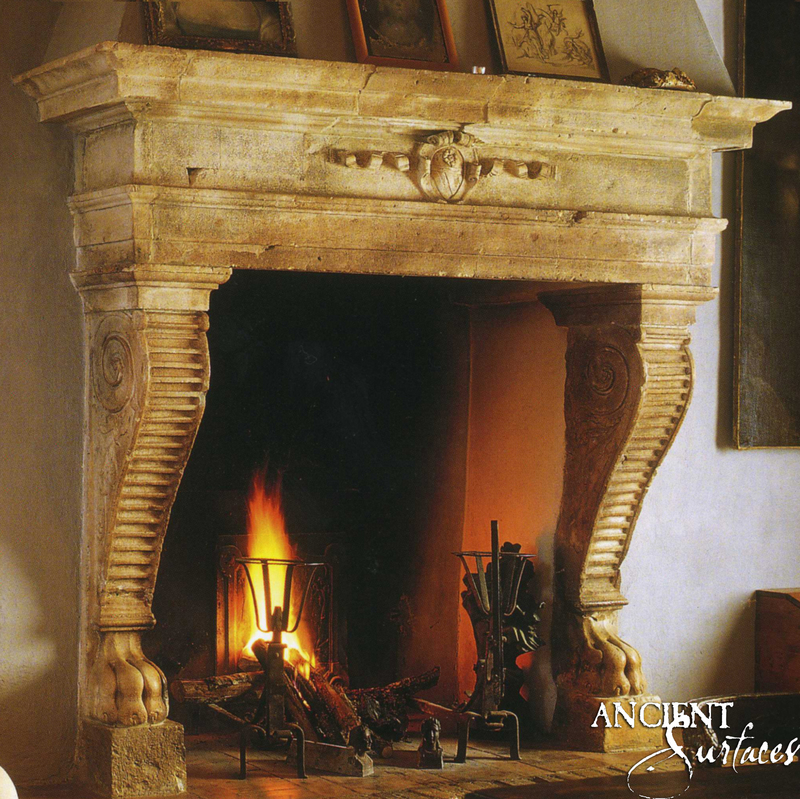 Various kinds of stone such as dolomitic limestone, brachiated marble or even basalt rock in some instances were used by pas carvers to create some of Europe’s most elaborate fireplace mantels for the last ten centuries. 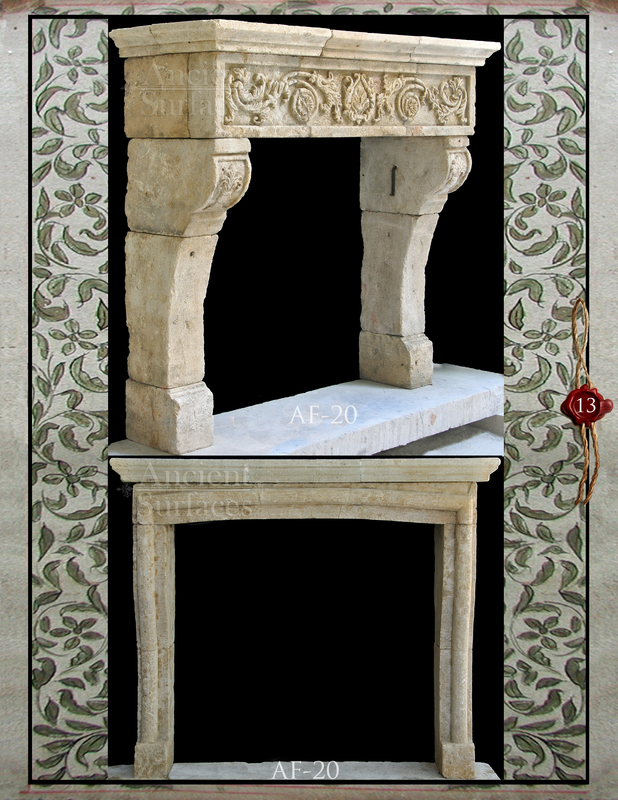 Elaborately hand carved antique marble fireplace, restored by Ancient Surfaces. 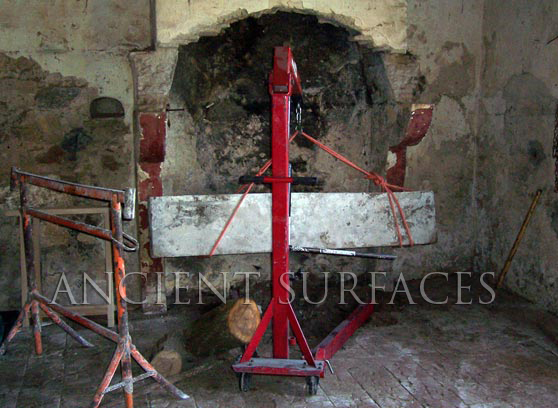 So what is the best kind of stone to carve mantles out of? 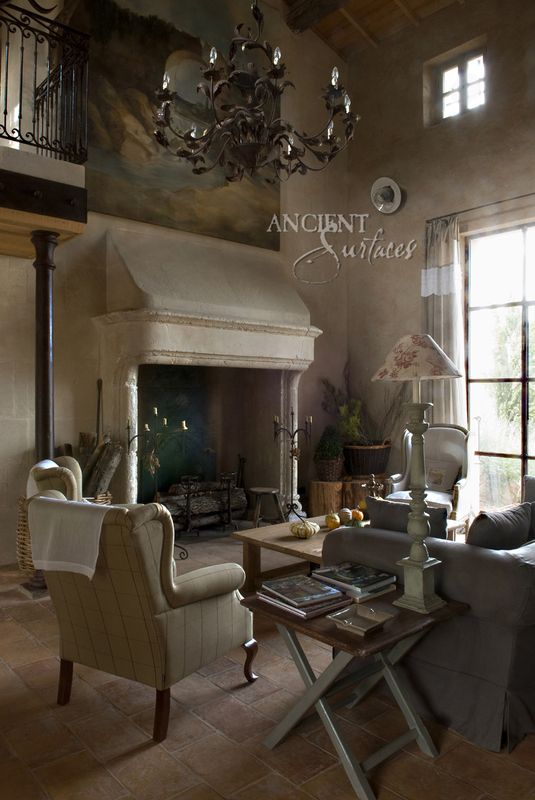 This stone remains uncontested since it grants mantles an eternal durability while allowing them to age gracefully. It’s a great heat conductor yes soft and textured to the touch. 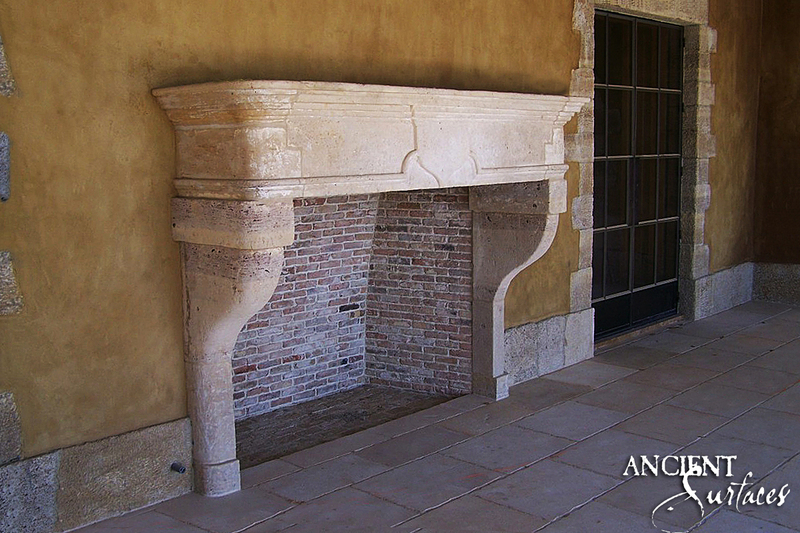 An Antique French limestone fireplace acquired by the current owner of this Mediterranean Countryside style home in Orange Country, California. 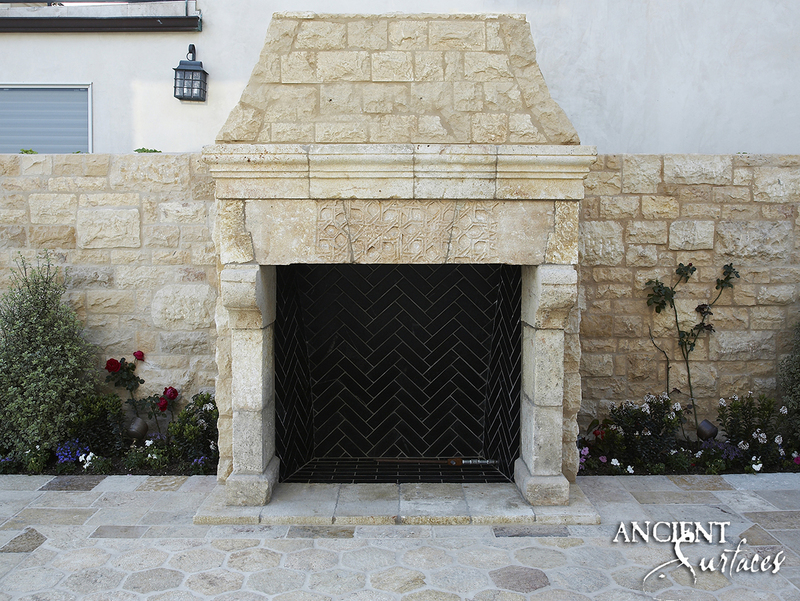 This stone is seen in the most well preserved fireplaces in the world that were once carved out of. It is called the ‘Oolitic Limestone’ and its raw blocks are highly prized by master stone carvers from around the world. 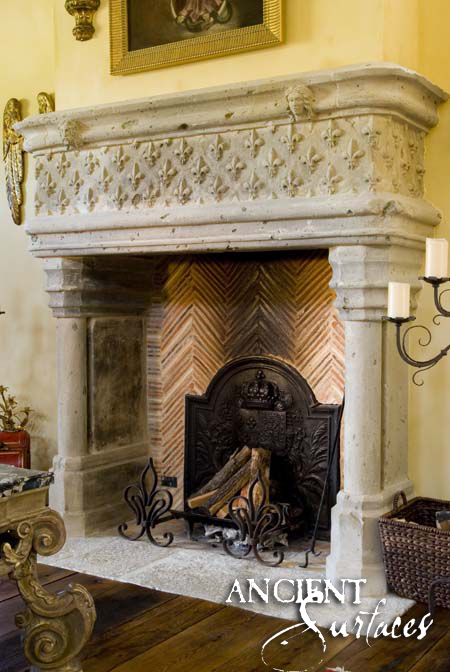 As for the style of mantles goes, the most popular kind of fireplace mantel today are South European or the Tuscan or French Bastide and Normandy styles that are based on one simple philosophy of simplicity equals beauty, as long as that simplicity didn’t stand for losing the personality and historic characteristic that defines that particular fireplace and help set it apart from its counterparts. 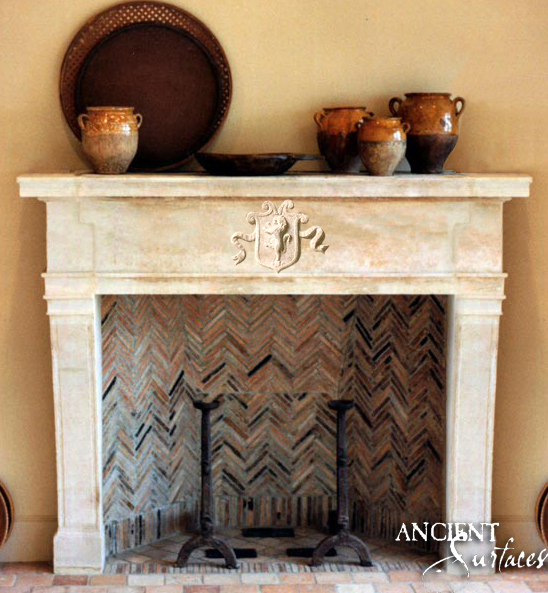 A Simple and Clean Line Antique Fireplace Mantle by Ancient Surfaces. 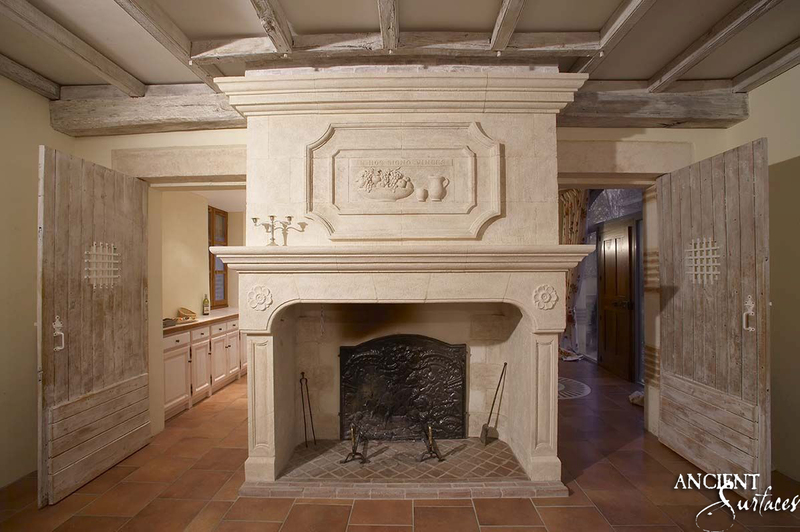 Mostly sculptures realized in this style were a simple way for countryside residents to have functional yet elegant hand carved stone mantle that resonated with the simple countryside way of life. 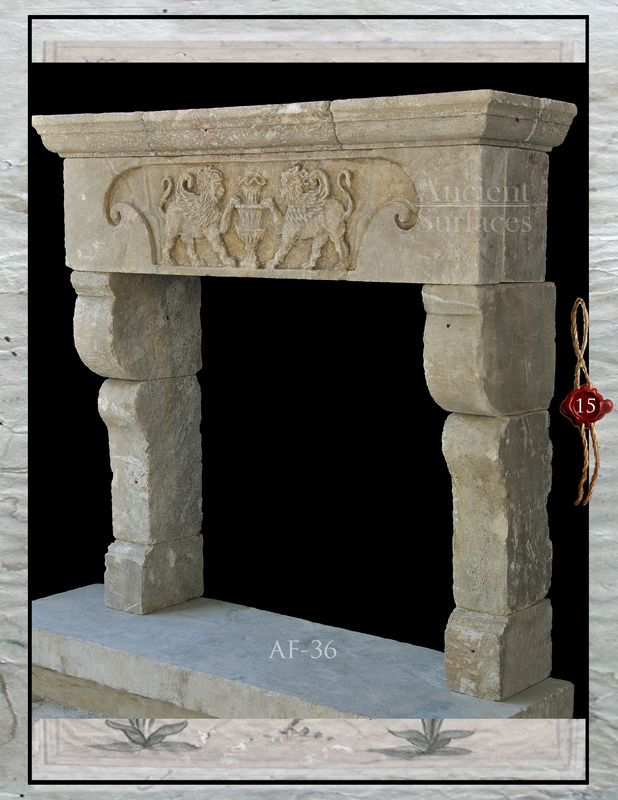 Simple countryside hand carved fireplace mantle out of Oolitic Limestone by Ancient Surfaces. 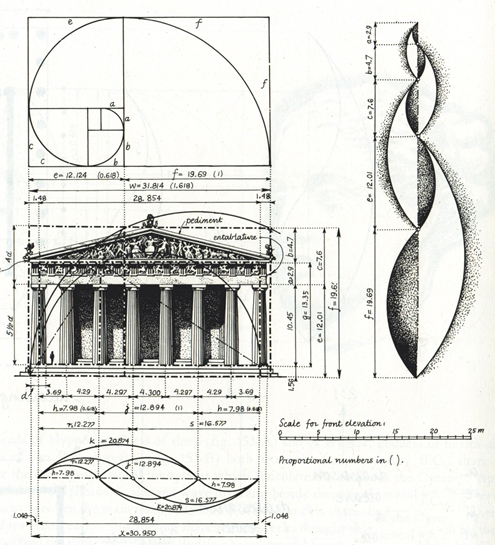 They still offered a perfect balance of design and proportion based of the utilization the ‘Golden Ratio’ and ‘Golden Mean’ and by utilizing many other carving and visual tricks like the play on the visual perspective, ‘Chiaroscuro’ shade manipulations, ‘Foreshortening’ the play with lines, and ‘Sfumato’ which consist on blurring or not fully carving a section to give it a perception of distance. Limestone Entryway in a National Landmark. 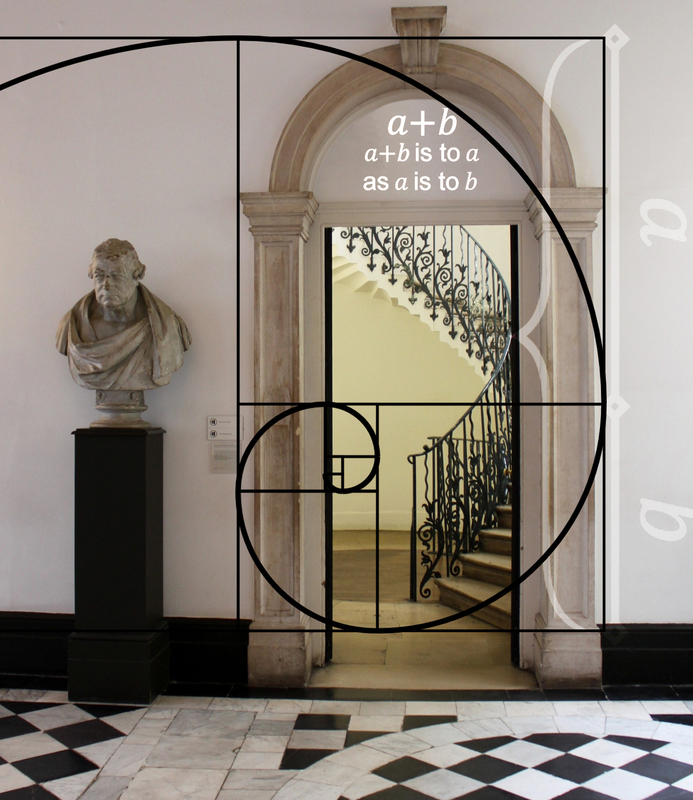 Height and width designed and carved using the golden ratio proportions. 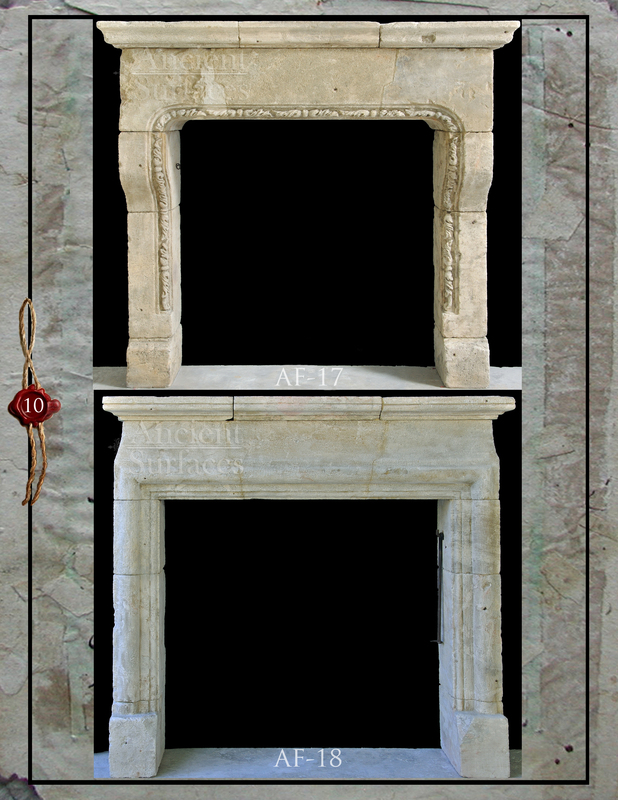 All European regions are splendidly depicted in the mantel designs that originated from them. They speak volumes of the old continent past vestige and it’s timeline. When designing a house selecting the style of the fireplace will help you define the overall type of the home you want to build and live in. 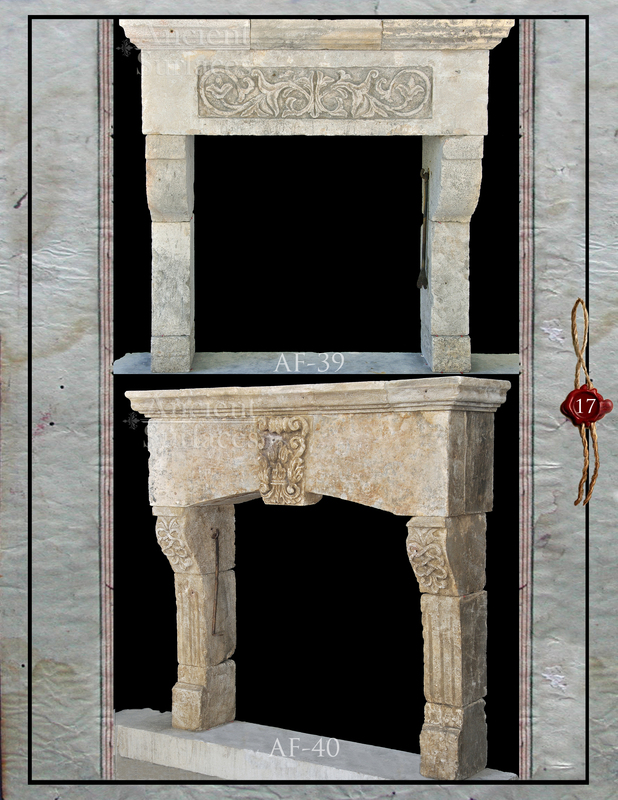 Hand carved limestone fireplace mantle. The 19th Century Italian Librarian style. 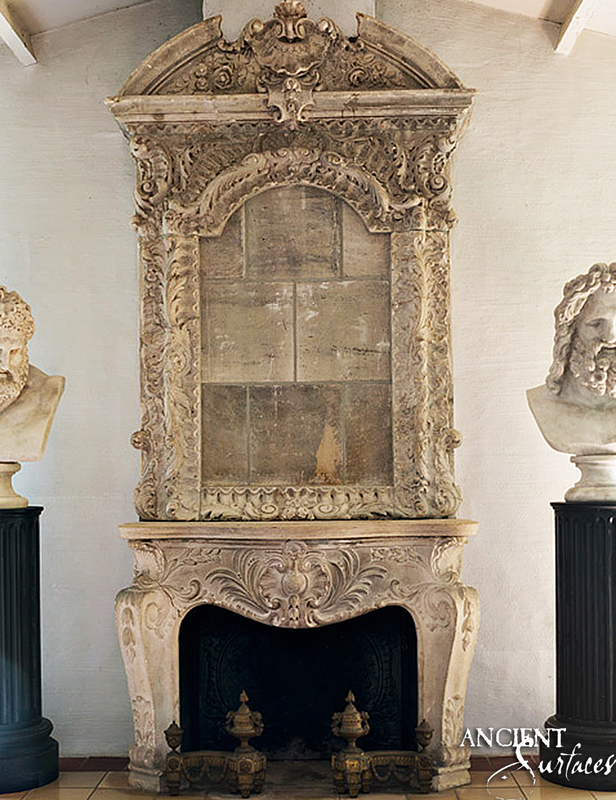 The earliest known mantel piece is the one in the Kings House in Southampton. It was carved in the 12th century and is a classic example of splendid old masters craftsmanship. 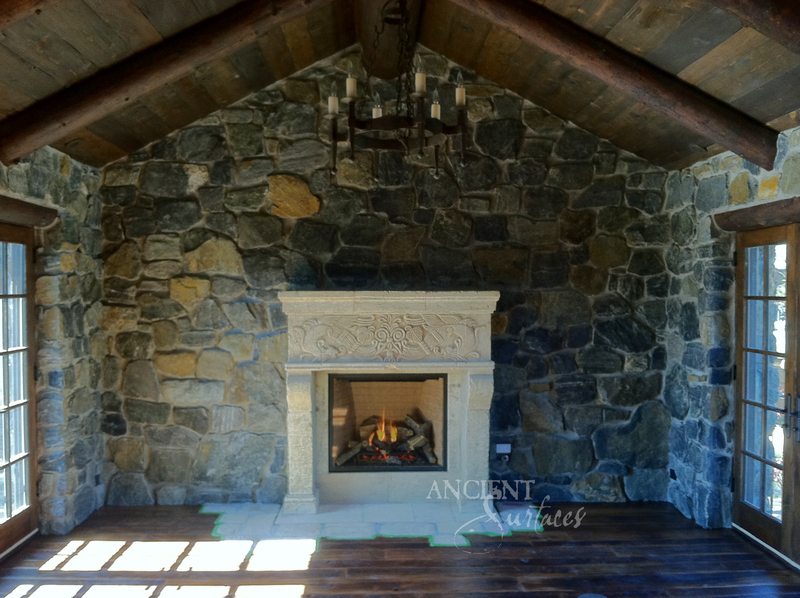 A 12th Century antique Stone fireplace salvaged from the South of France and installed in a Colorado compound. 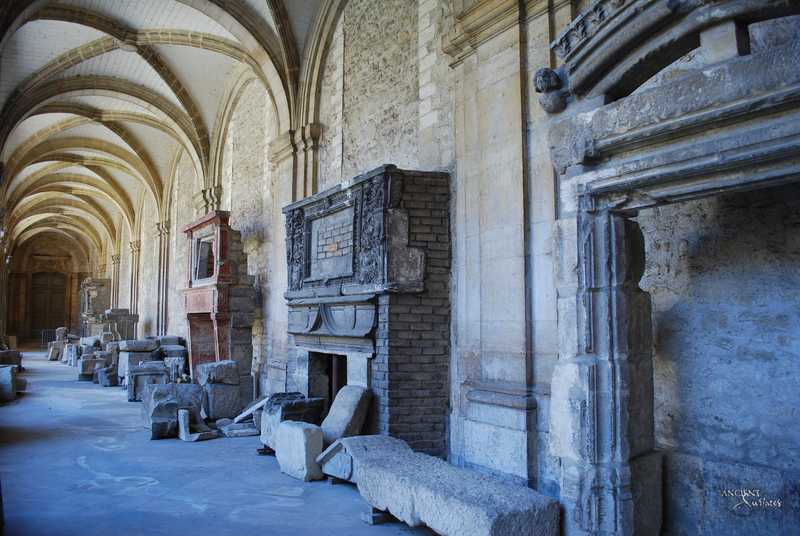 A very wonderful example of the early Renaissance style fireplaces is the mantelpiece of the ‘Palais de Justice at Burges’. 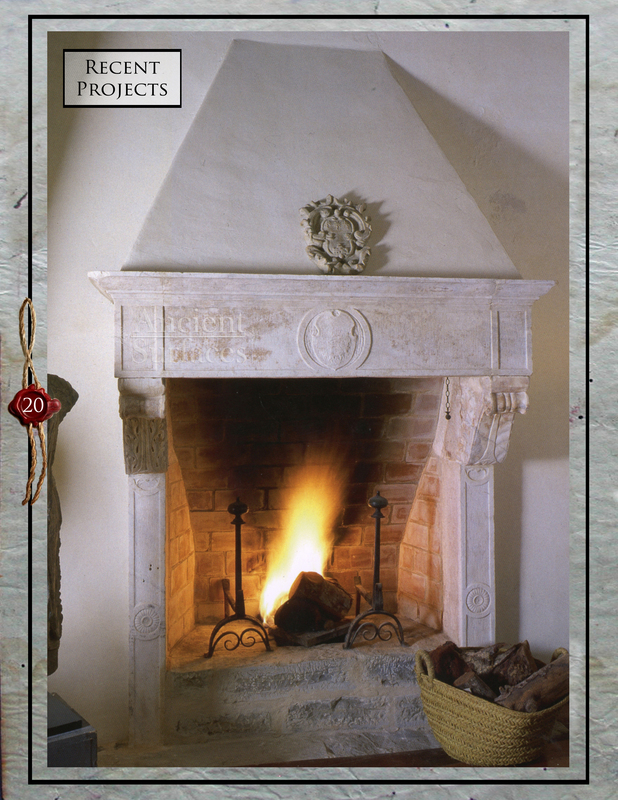 Seventeenth century English era saw the introduction of pure Italian style of fireplace mantel pieces. 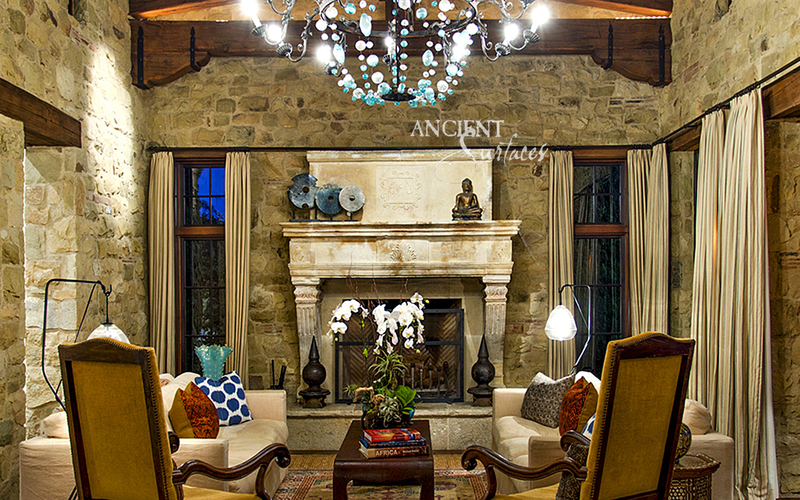 Antique Reclaimed 12th century Limestone Fireplace in its final home in Colorado. 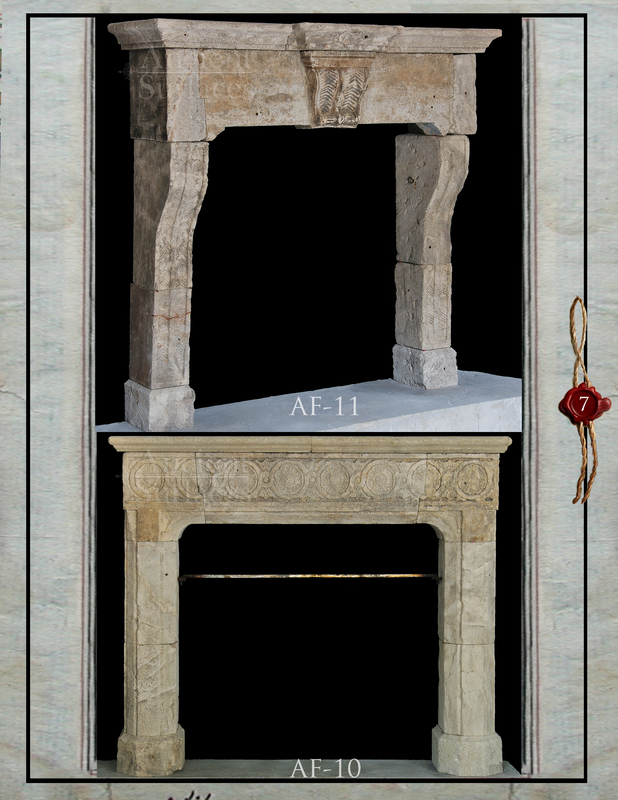 These mantels were very simple in style but had an elegant look. 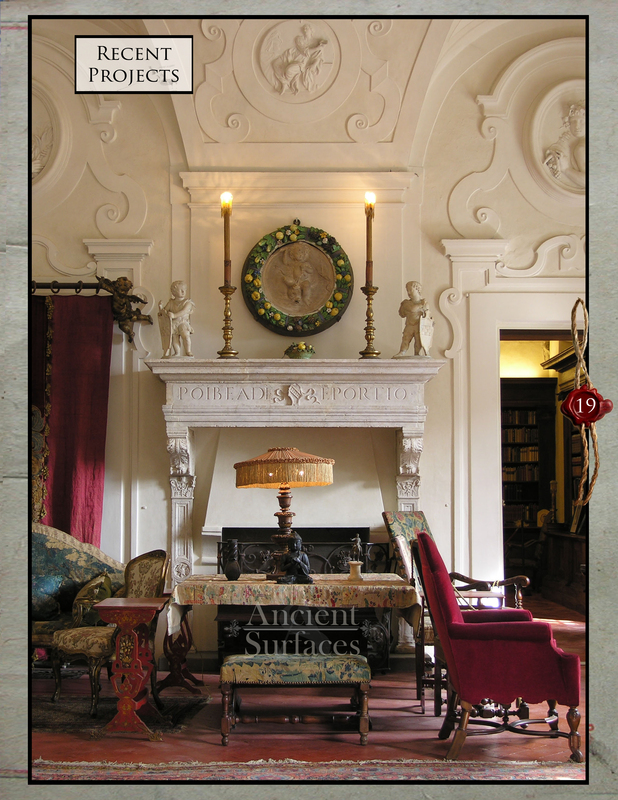 It was only in the latter part of the 17th century that bolder and molding styles were introduced. 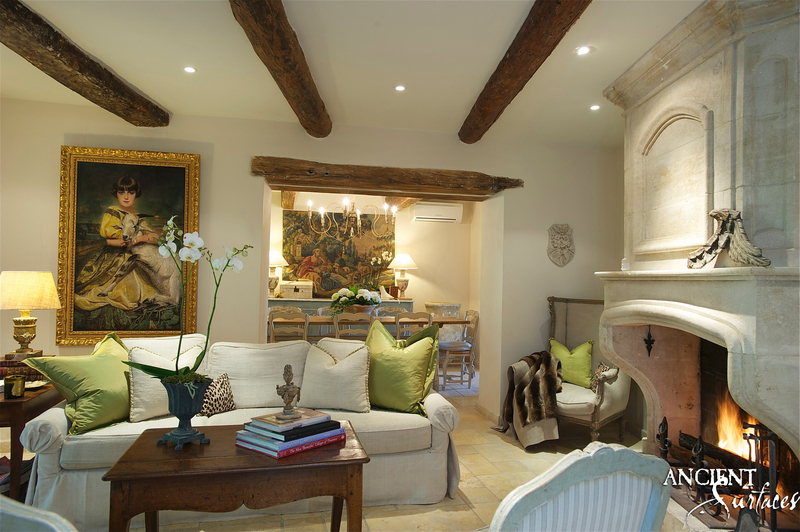 In the 18th century the rise of French style of architecture was seen and the designs of the mantels too were influenced by the French style. 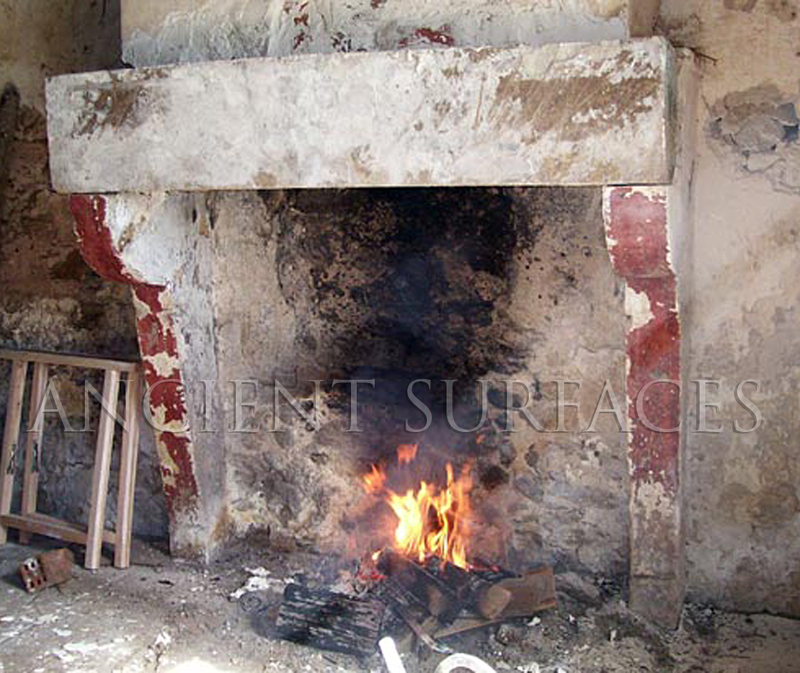 A reclaimed 18th century French Fireplace Mantle from Burgundy. 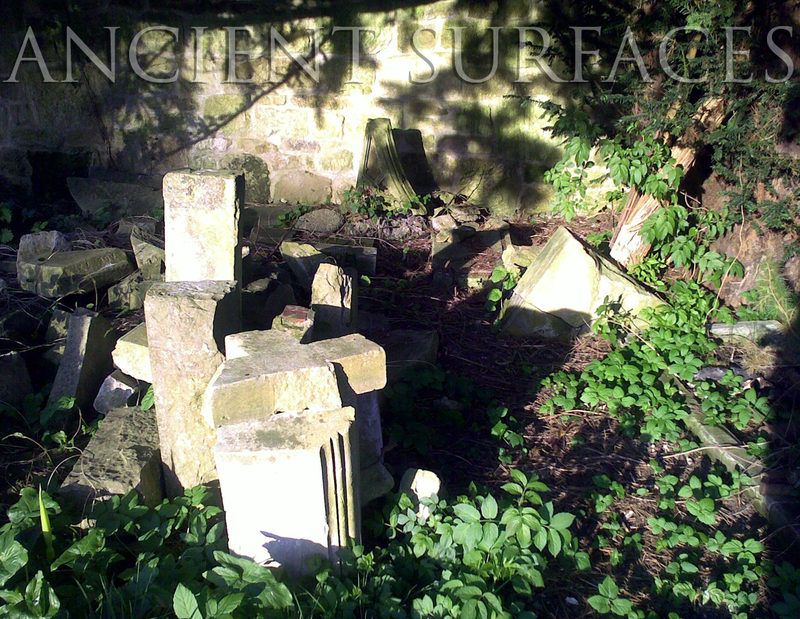 Reclaimed by Ancient Surfaces sold by dealer to current owner. 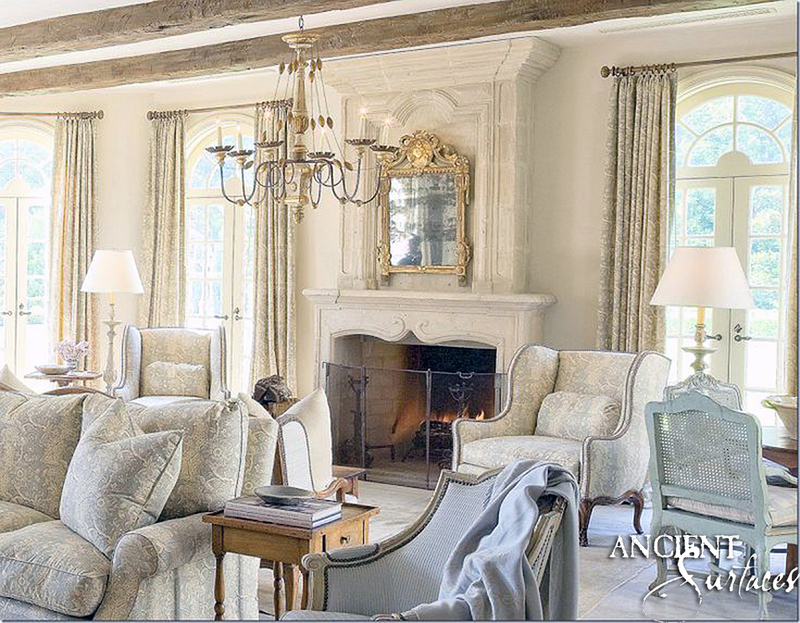 The other different but very elegant styles of fireplace mantels include the Classic Tudor, Jacobean, Victorian, Georgian, Gothic, Louis Style, Pompadour, directories… Antique fireplace mantels of the above mentioned eras and designs have gained a lot of popularity today. 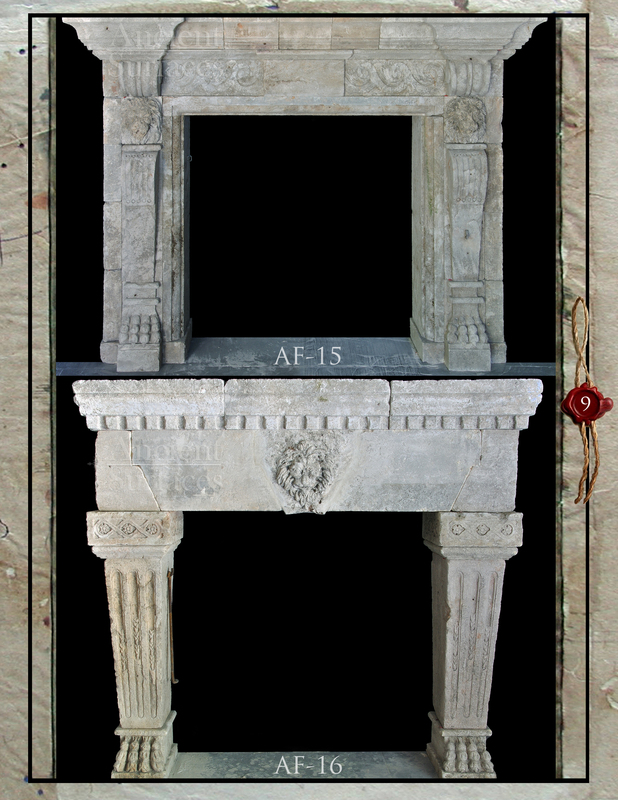 A reclaimed 17th century French Fireplace Mantle from Aix-En-Provence. Reclaimed and sold by Ancient Surfaces. 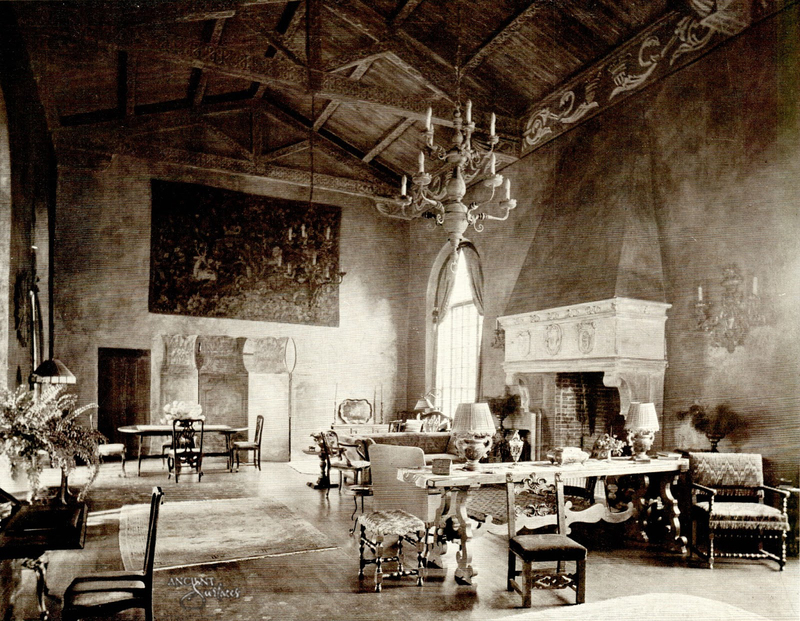 There’s a good chance that most antique fireplaces you purchase on the market today would have originated from France or Italy where a bulk of architectural antique salvaging, acquisition, sale and storage reside. 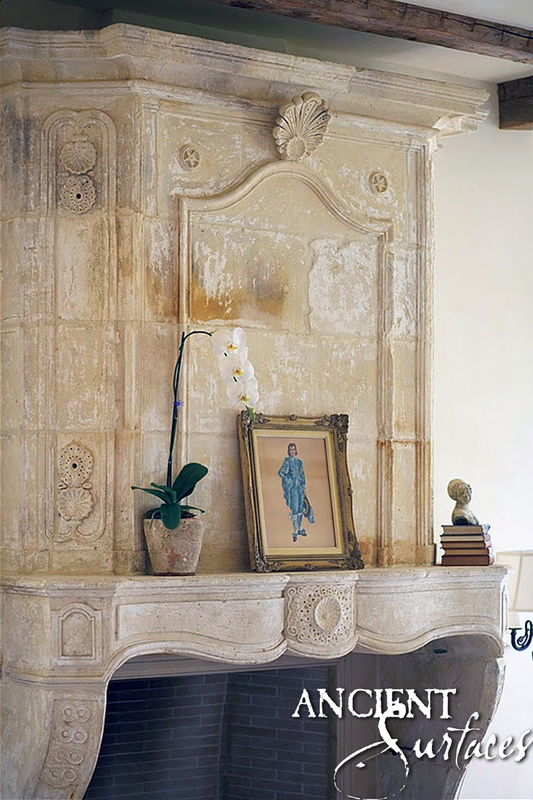 A reclaimed French Fireplace Mantle from the South of France. Reclaimed and sold by Ancient Surfaces. In recent years a sensational thirst for rare and unique stone elements have surged all around the English spoken world from England to the United States and from Australia to Canada. 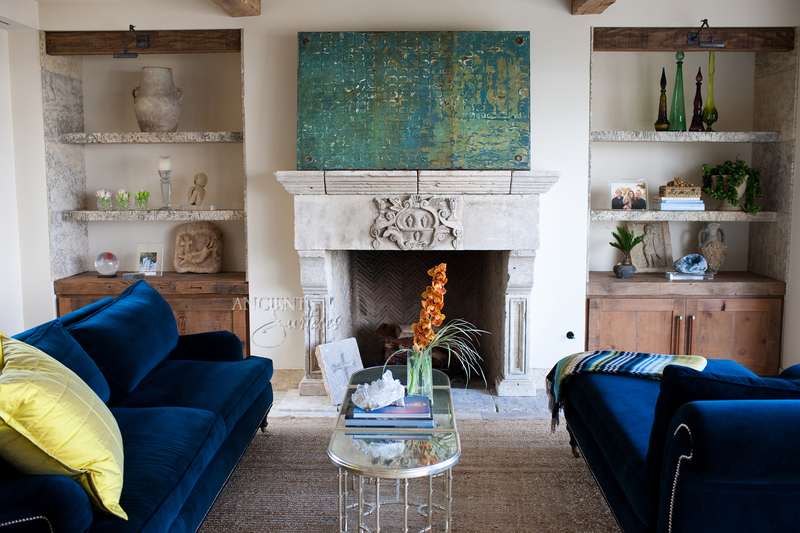 A reclaimed Italian Fireplace Mantle from the North of Italy. 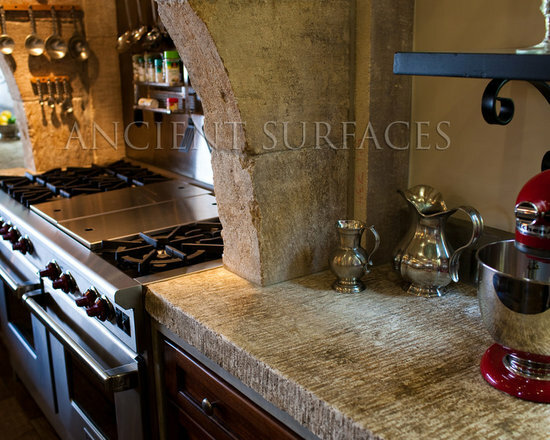 Reclaimed by Ancient Surfaces and sold to clients through a local dealer. 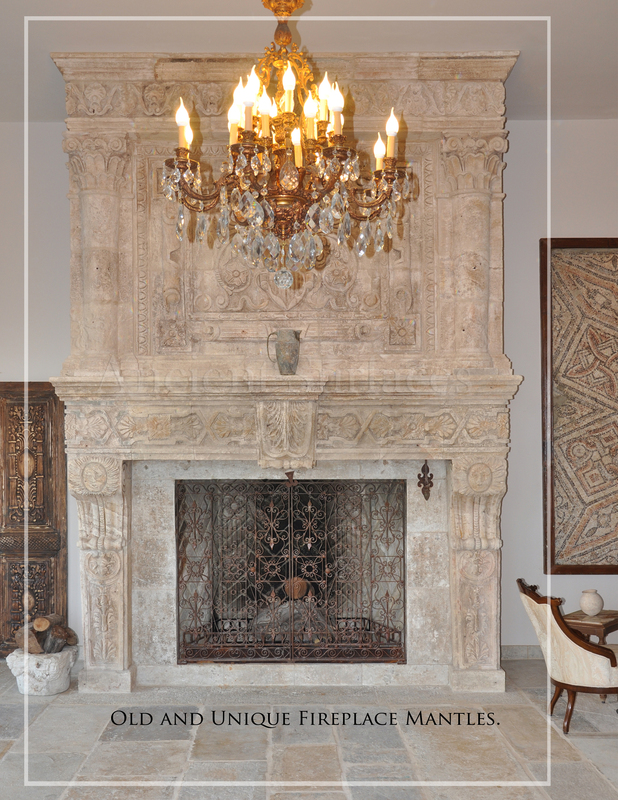 This recent spike in demand had put the pressured on supplies of genuine antique stone elements especially on one of a kind antique fireplaces. 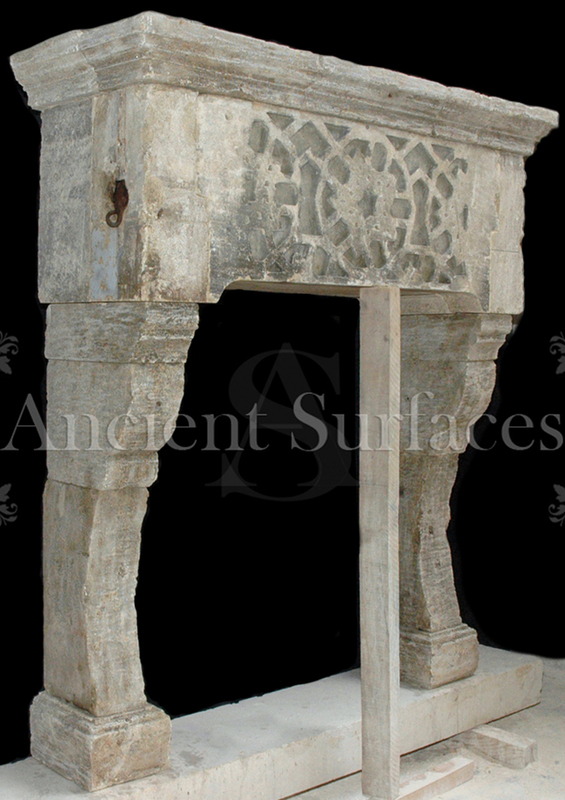 To learn more about those fascinating and unique architectural gems as well as their hand carved exact replicas feel free to please contact us through our website at Ancient Surfaces. Salvaging isn’t only a happening kinda think that started in the last few years with the rise of the global green conscience… It’s a bit early than that. 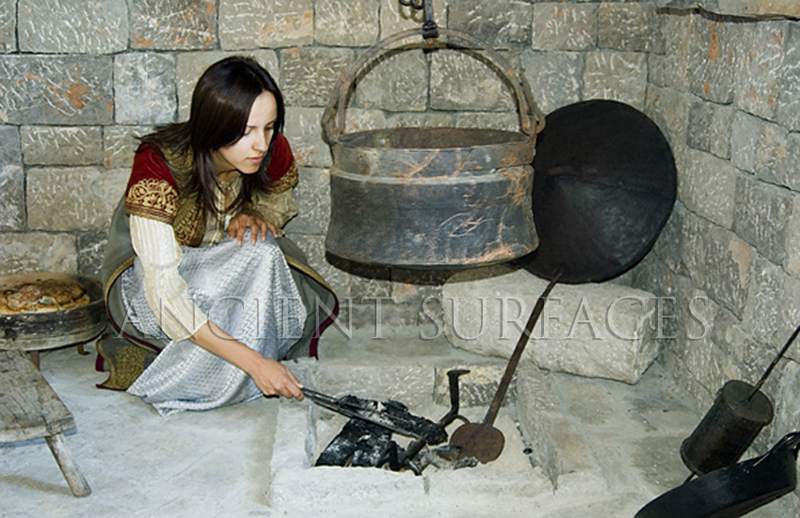 Reenactment in utilization of ancient cooking tools and techniques. Similar cooking tools were salvaged by humans and reused from one culture to the next. Salvaged Twice! 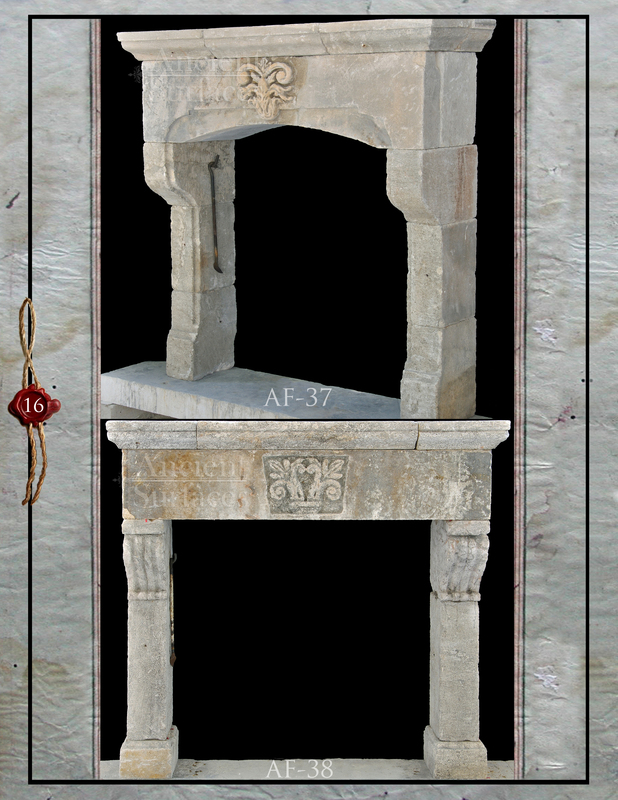 one as a fireplace the second as an entryway. 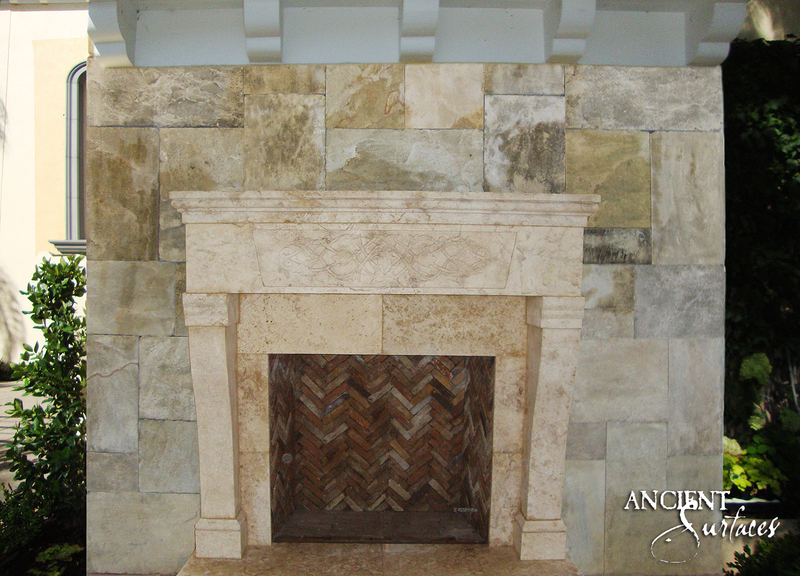 An Antique Stone Fireplace with 3 Layers of Paint, Missing its Top Shelf. 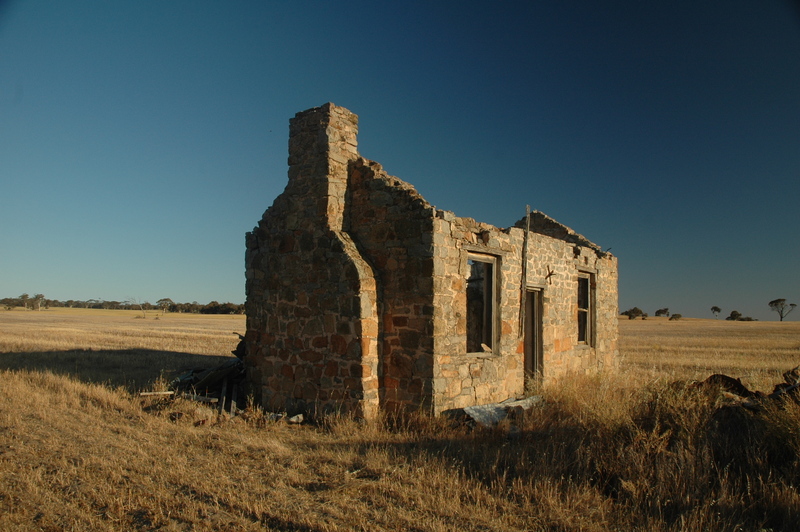 Image taken prior to reclamation. To in involved in this reclamation process is nothing short of a spiritual experience were one painstakingly rediscovers the lost and narrow path to redemption and enlightenment trough hard labor, vision and determination. 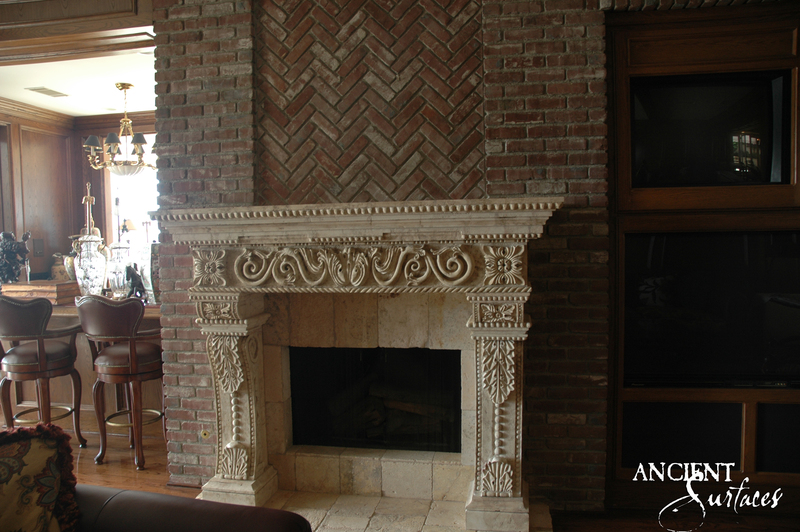 Do you think that our Mantels are captivating? 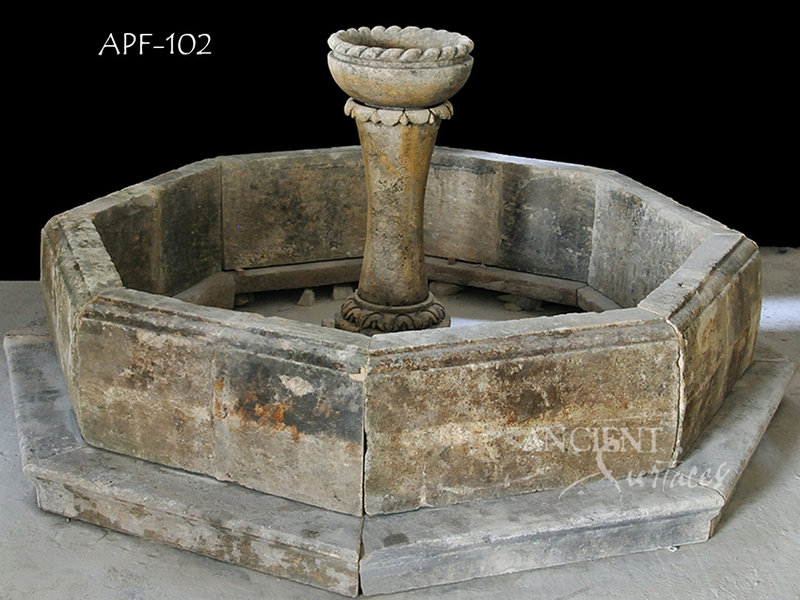 Take a tour of our antique pool fountains and try not to fall in love with them, we dare you! 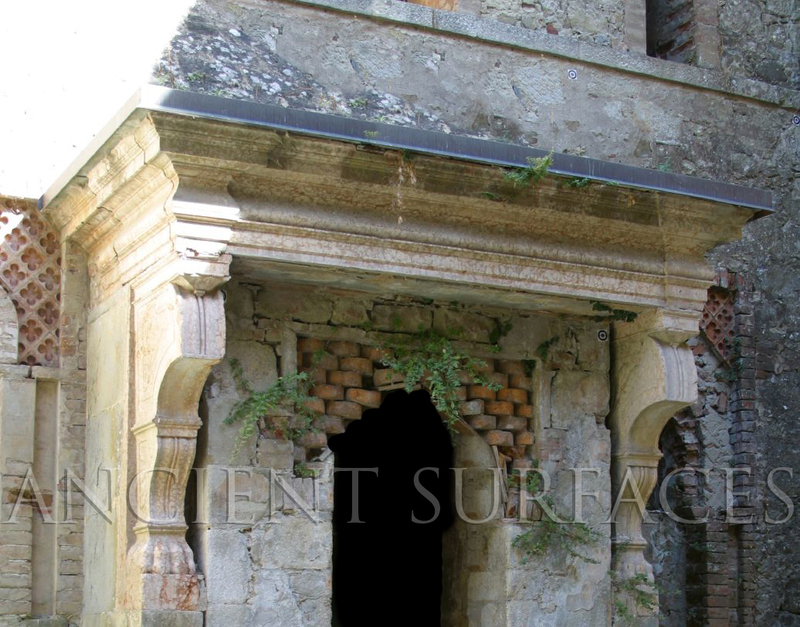 A unique ancient reclaimed stone entryway salvaged from Italy circa 16th century. 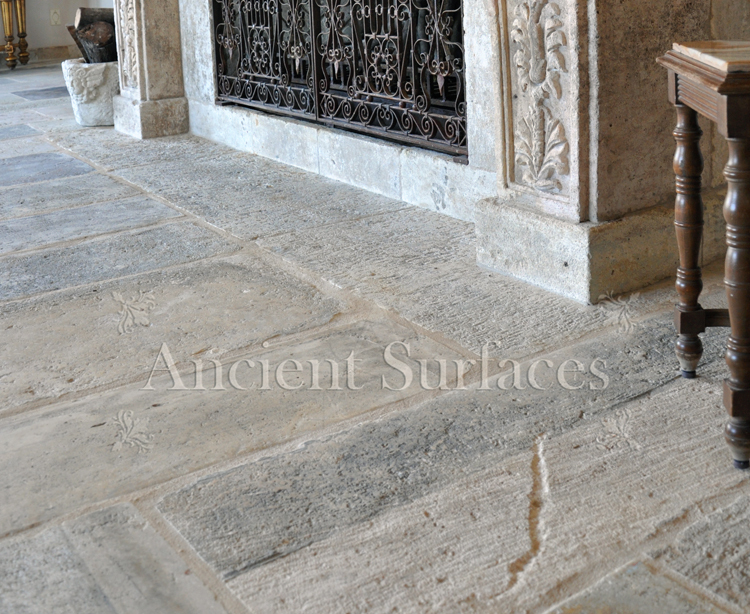 Antique reclaimed stone flooring pavers over 600 years old. 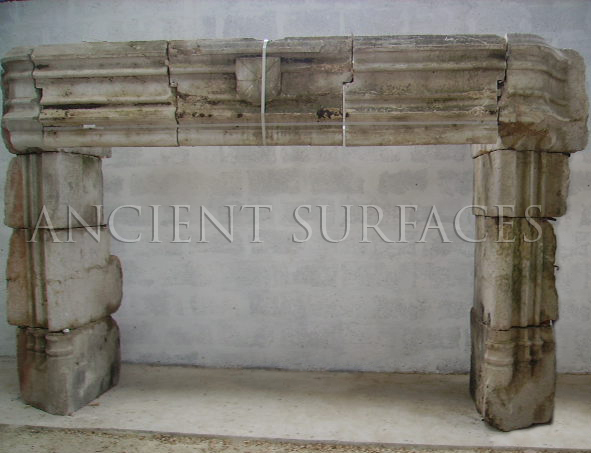 Antique Biblos limestone 600 years old reclaimed flooring iles and pavers.